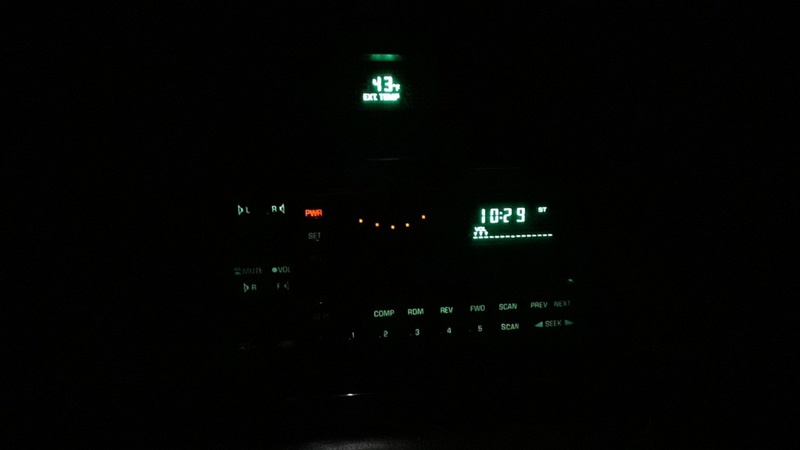 It needs to be said that this car has over 300,000 miles. For that many miles it's in amazing shape. Mike, how deep is your backlog? I might have something for you here soon. 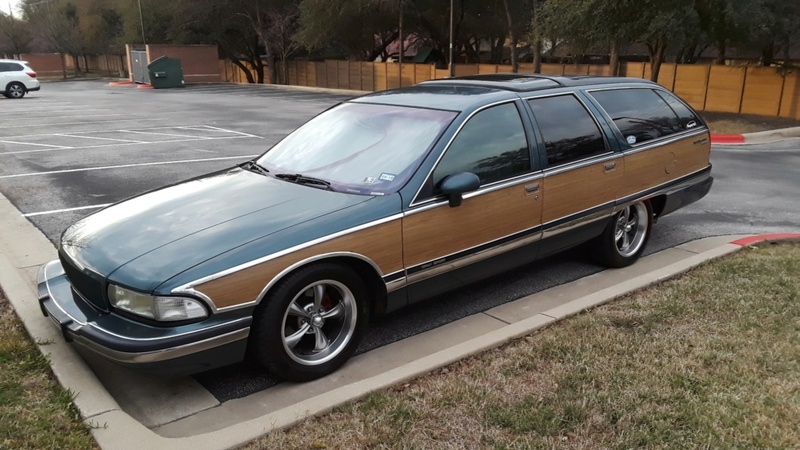 1994 Roadmaster 6spd Manual Wagon Refurbishment - So I'm about to do a light cosmetic and mechanical refurbishment on the somewhat-famous "NotRod" owned for years by Tim when he lived in Pennsylvania. 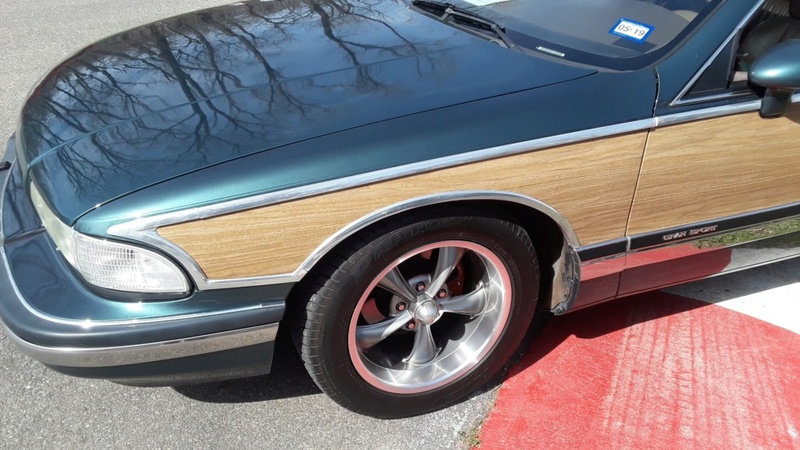 This car is well-known in the Impala SS and Longroof/Whale-Wagon communities. 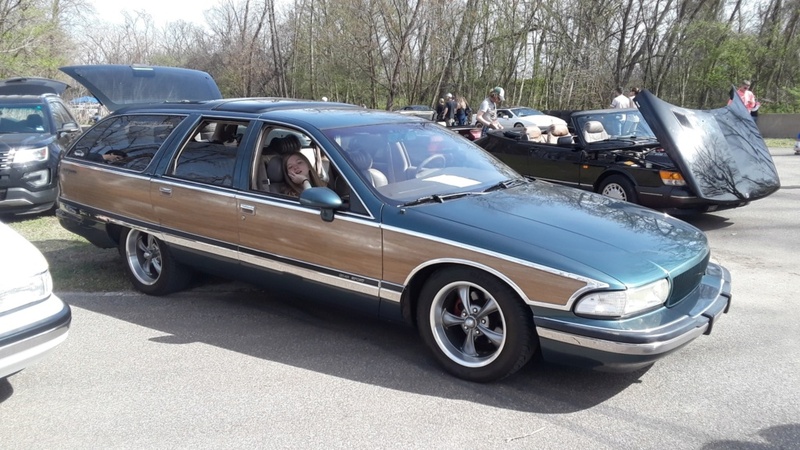 Tim's love, work and attention to detail on this car are well-documented, and the car was part of numerous Wagonfests and car meets and events over the years. 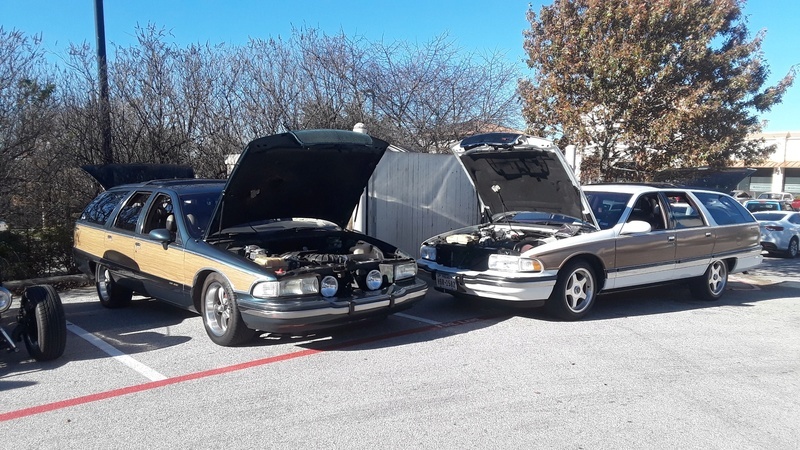 Tim recently sold the car to a good friend of mine out in the Texas Hill Country, and I picked it up this past "Black Friday" to begin a refurbishment process. 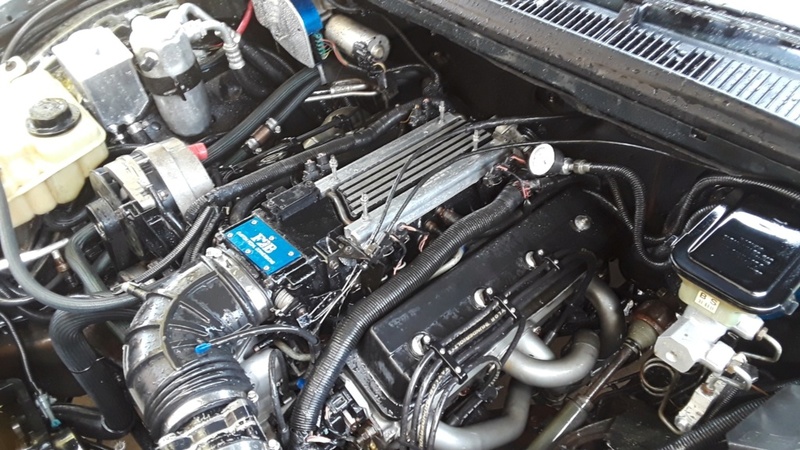 - LT1 engine bored to 355/227 Crane cam/ported alum heads/Comp cams 1.5 RR/Corvette starter/beehives/Tri-Y headers without CATS. On picking the car up in the Texas Hill Country we drove from Fredericksburg to Kerrville, then down to San Antonio and back to Austin, so I was able to give the car a real 200+-mile shakedown run. The car is a beast, starts with a ROAR, and it has power EVERYWHERE. I can best describe the driving experience as "manly". 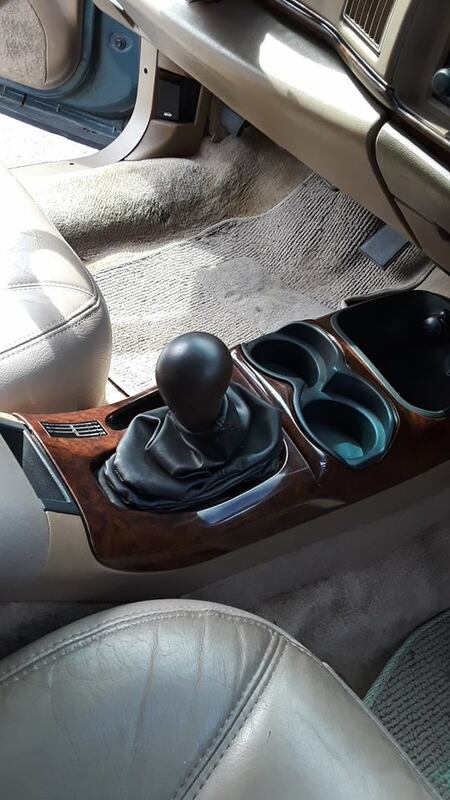 The clutch is HEAVY, the shifter is SOLID and requires a firm hand to row, but in a great mechanical way that reminds you of how manuals are MEANT to feel. The exhaust system is LOUD and the car sounds amazing and flat ANGRY. 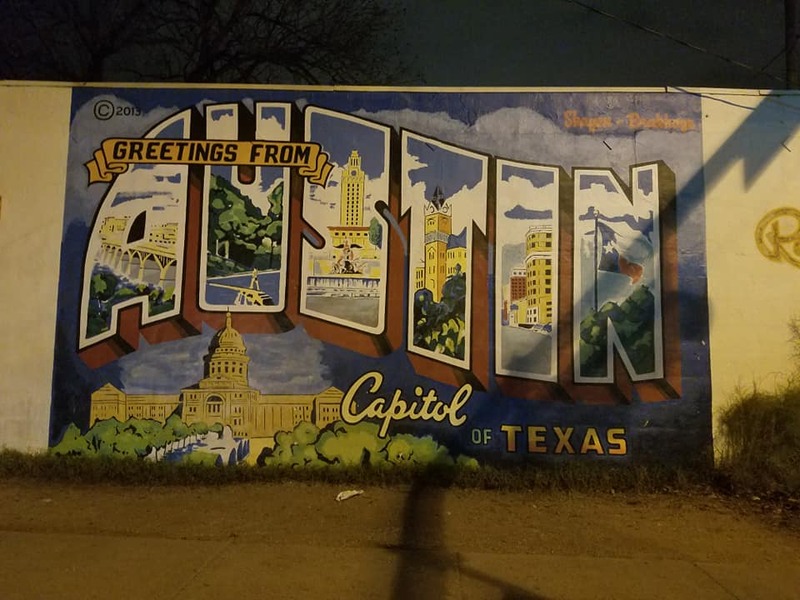 We got stuck in rush-hour traffic in downtown San Antonio for nearly and hour, and my clutch leg got a workout it hasn't had in years...that leg was sore the next day, ha! The steering is straight and power assist is very firm, but has some on-center play that I believe is age-related and in the box. 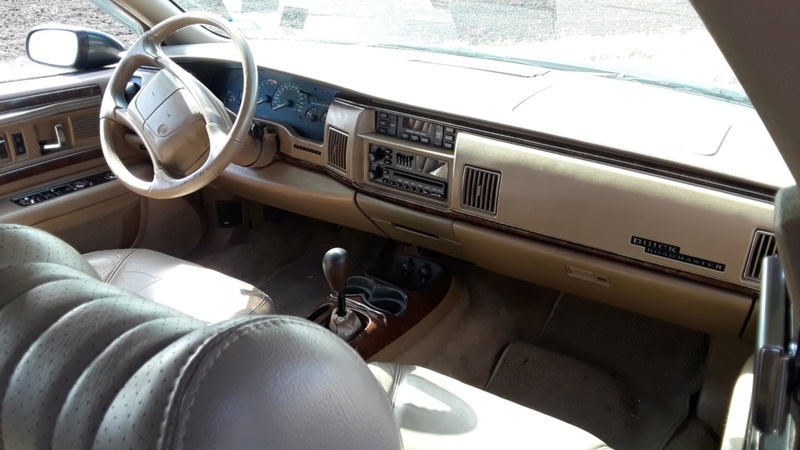 All the power windows work, locks work, keyless-entry works, even the original Delco CD player works and sounds good. 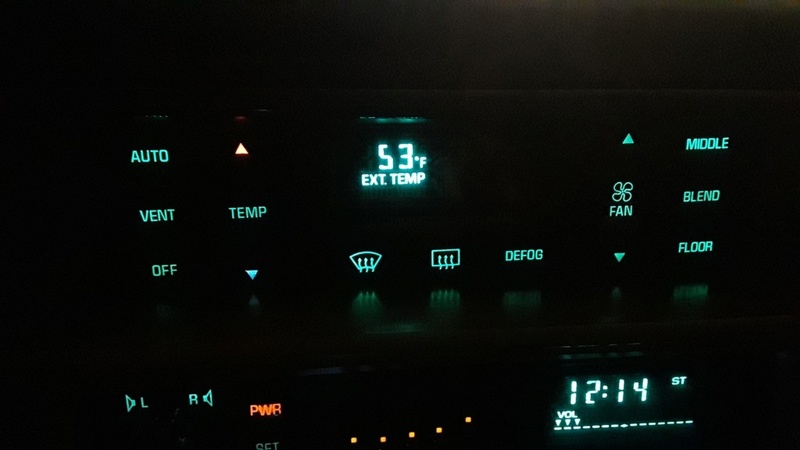 The A/C blows very cold and the cruise-control held speed fine on the drive home. 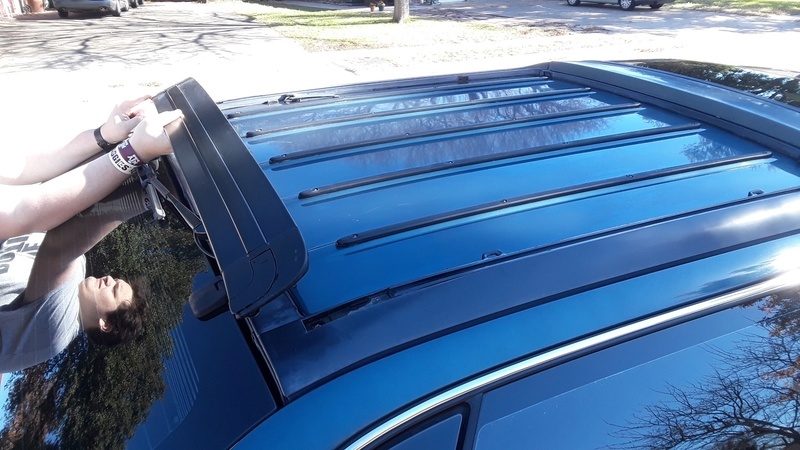 This car was always well loved and enjoyed, but it was also well-used by Tim as both a daily-use, business-road trip, and towing vehicle. 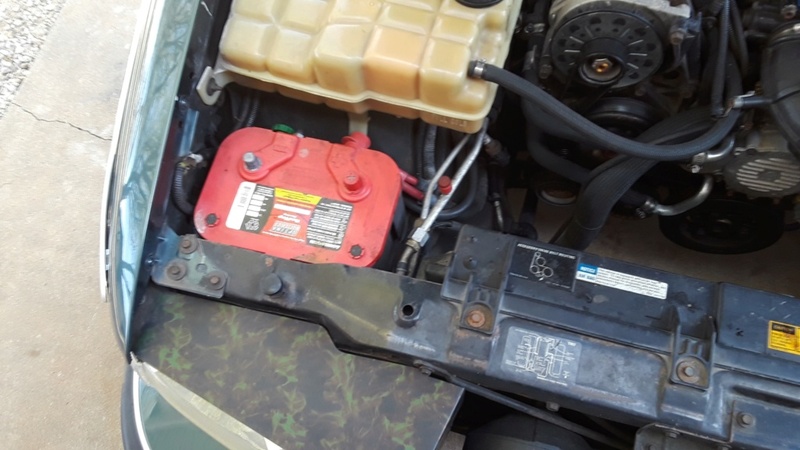 The car has lived through many harsh Pennsylvania and Northeast winters, and while it's still solid, it's a bit rough around the edges...something I plan to address. 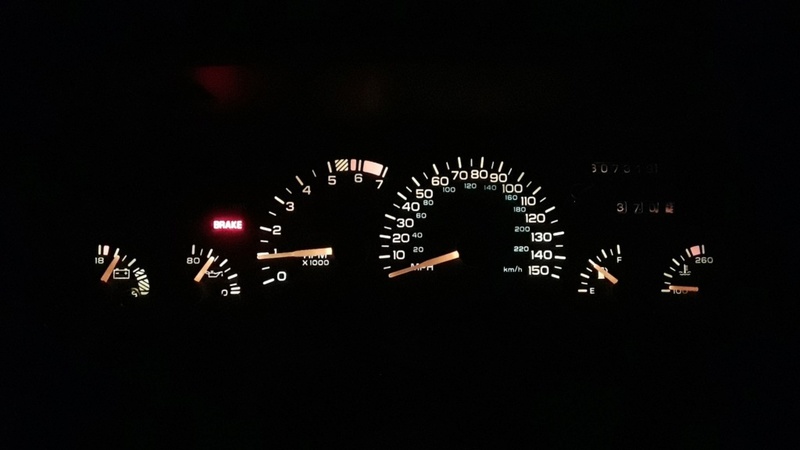 The body also has over 300K miles on it, but again all the modifications and updates don't have that mileage on them! 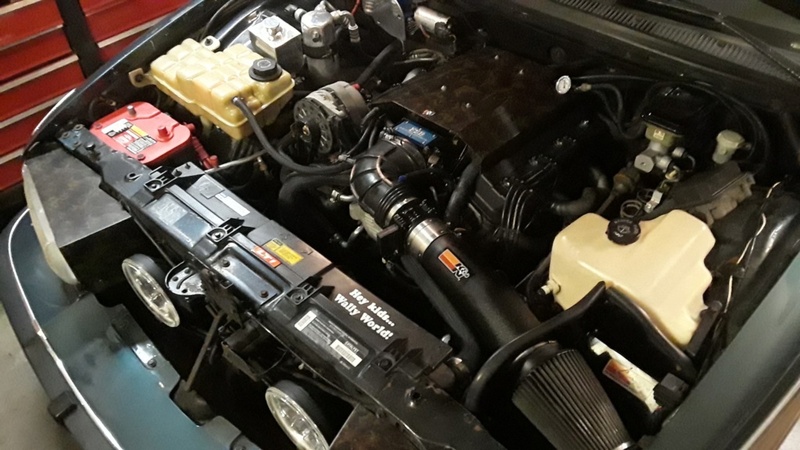 The first repair I did was re-mounting and re-aligning the passenger-side exhaust, which had been knocked back about an inch and was off three hangers (shipping issues possibly?). 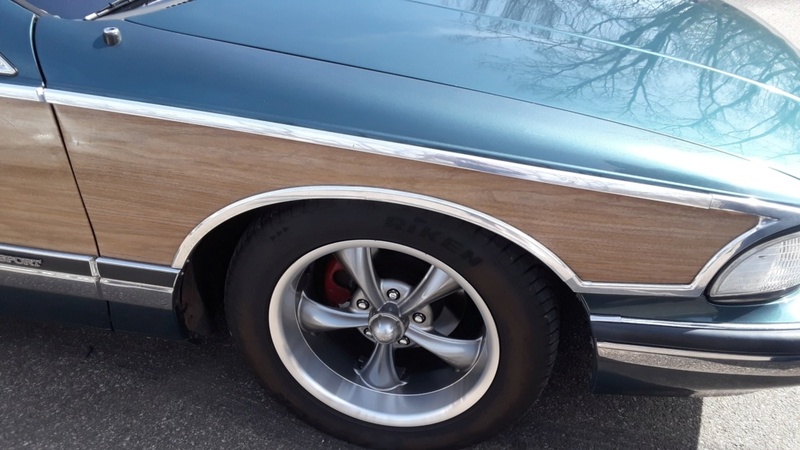 It was re-mounted and welded, and while in the air I was happy to see the frame is in GREAT shape and general underbody of the car are still VERY solid! 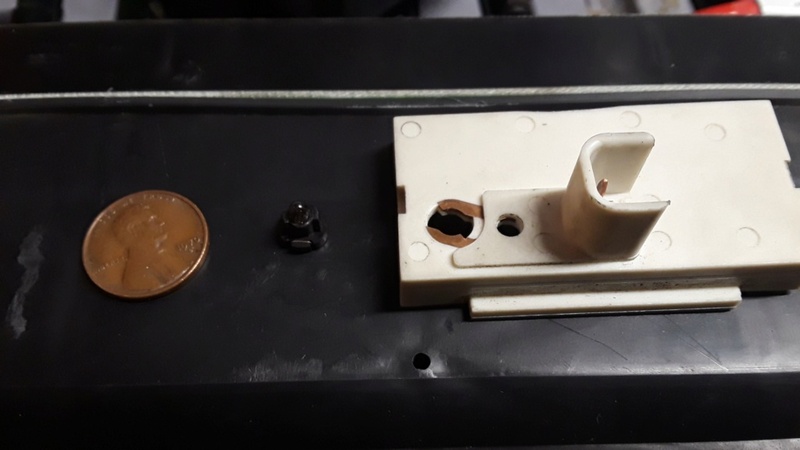 It has some light crust on the floorpans and on the mounts for the fuel tank straps, but I plan to wire-brush and rust-reform those. 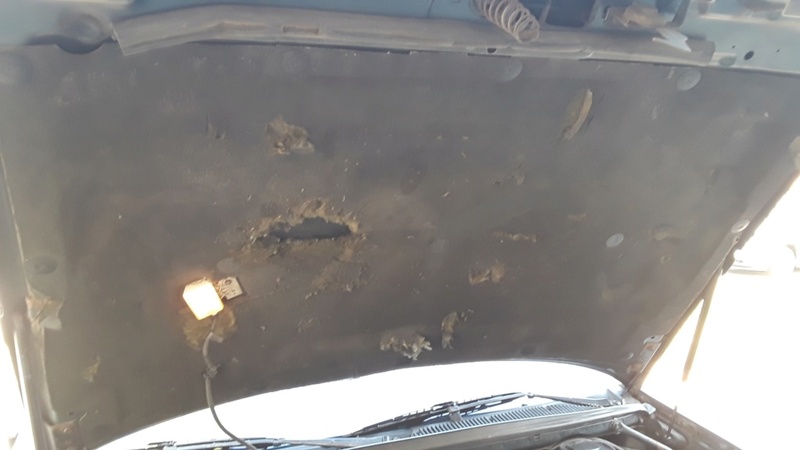 The only real rot on the car is the spare tire well (common) and some light rust around the screw holes where Tim had installed mud flaps. All that will be repaired. 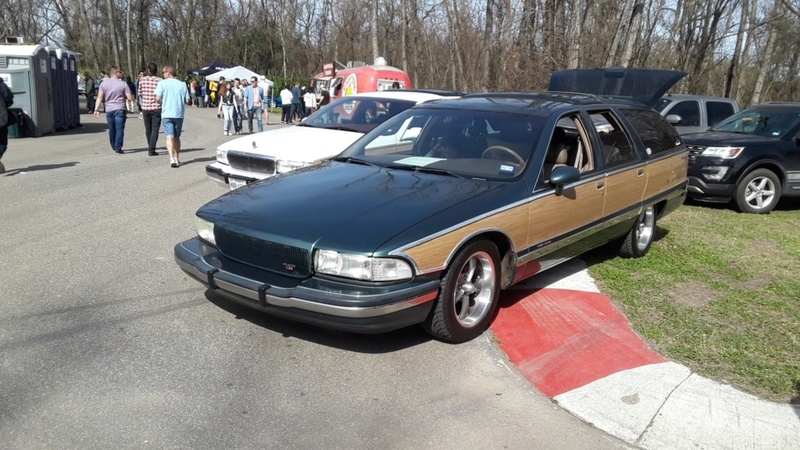 The car was a show car, but now has the usual age-related cosmetic issues and some general glitches are expected of a well-used Roadmaster. 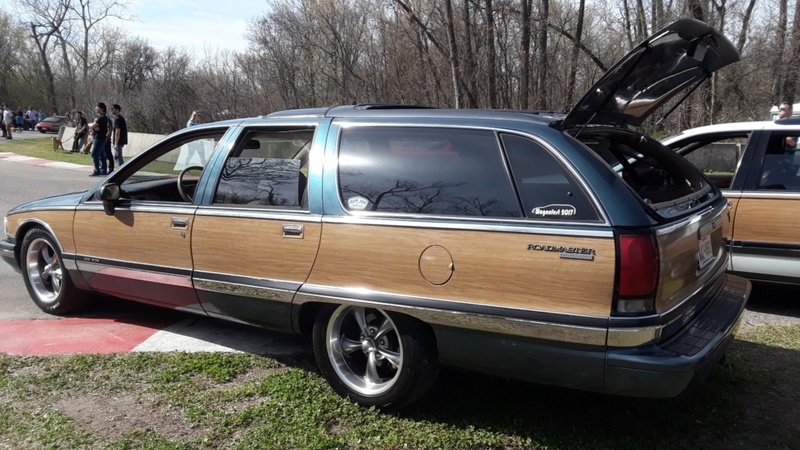 The wagon still has great bones, and it demands to be brought back to it's full former glory. 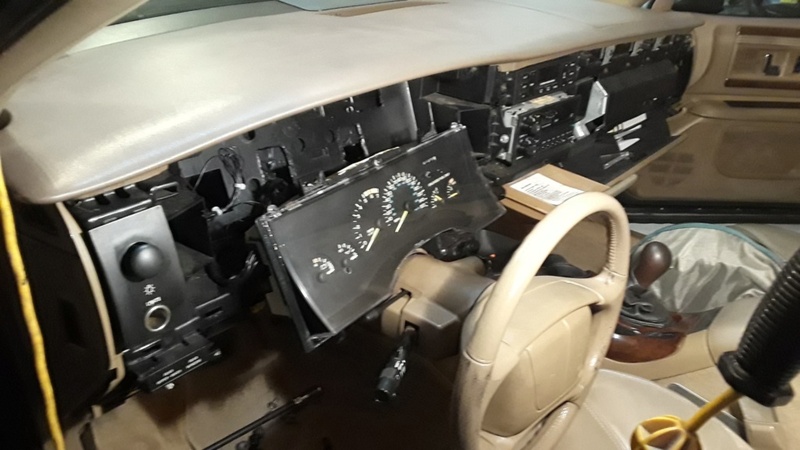 I'm planning to spend the next few months of weekends addressing most of these common Roadmaster repairs. I love these cars and know them well, and really am looking forward to getting my hands dirty on this wagon! 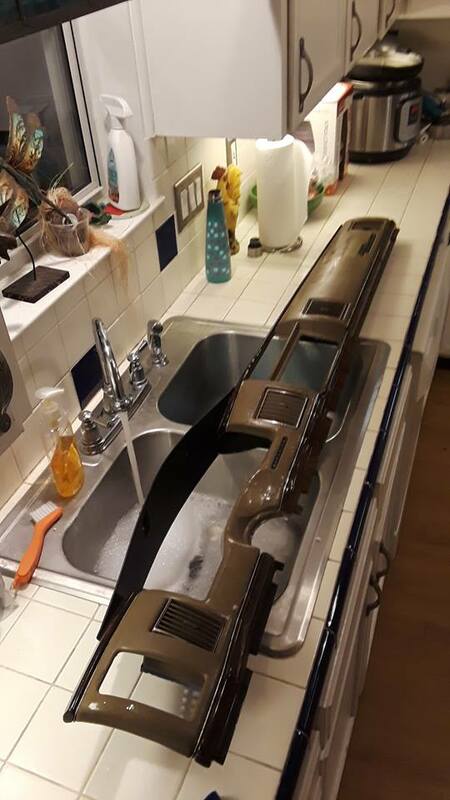 11/24/18 - Not cleaned or detailed in any way yet. Shakedown Run. My nephew Hunter totally fell in love with the car, as seen here. Not a huge NotRod update, and more details in the the Facebook Album linked above. Have had family/holiday obligations but am tinkering as I can! Hand-washed the exterior and cleaned the interior really well. Still not waxed or detailed inside, but much cleaner. 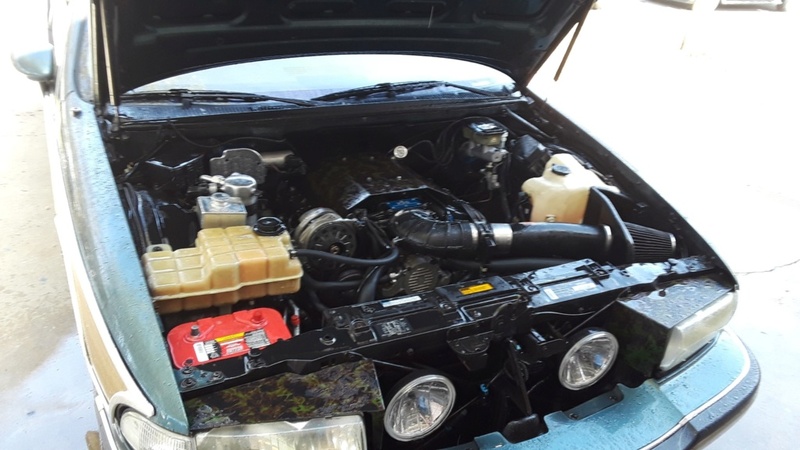 Next project will be TOTALLY cleaning the engine compartment, then come waxing and such, but still it cleaned up well! 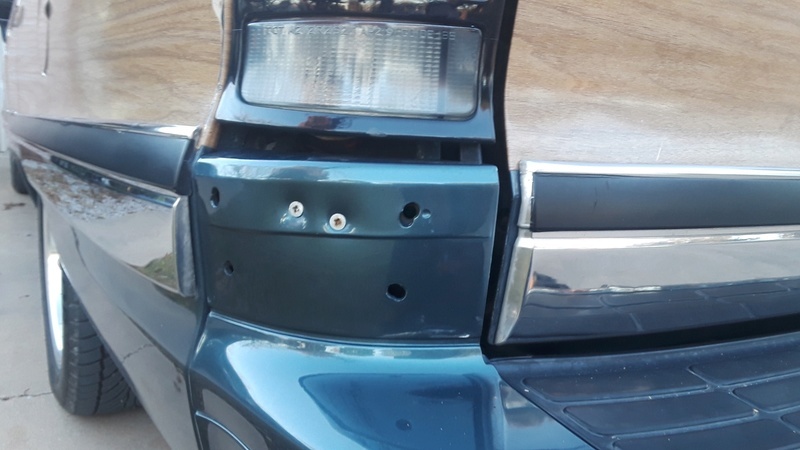 I also installed the replacement under-taillight trim on the driver's-side, using the "Christmas-Tree" clips to repair the broken stock clips, a trick I learned on this forum. Works great! 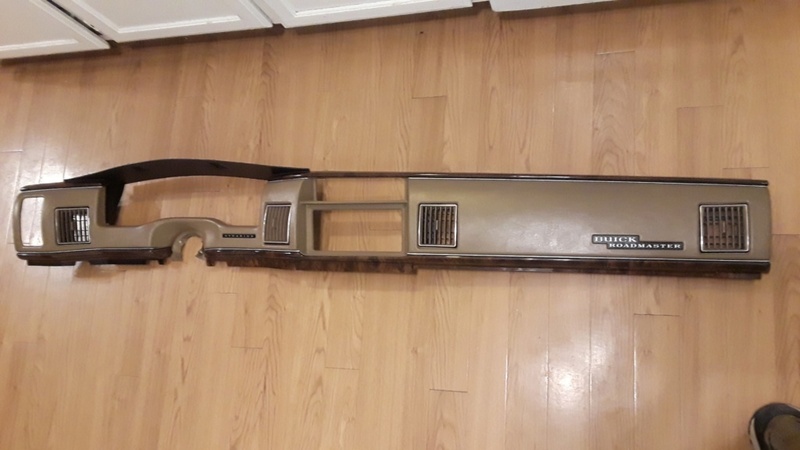 In addition, when going through my parts-stash I found the black flash-mount roof rack rail that's I'd removed from my '92 Olds wagon for a bright polished rail. Added the black rack to the NotR0d and it looks like it was born here! 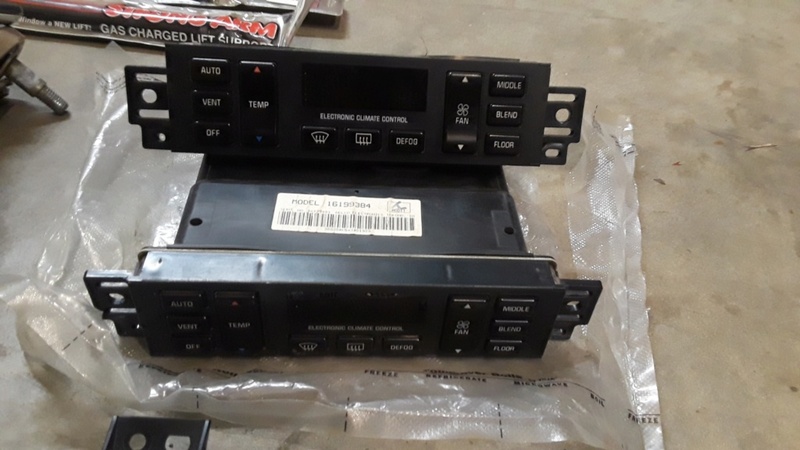 Rack no-longer looks "naked". 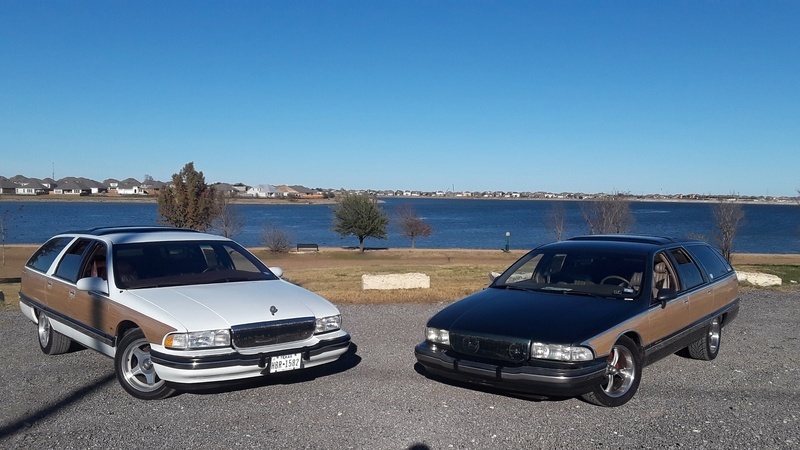 This past weekend my oldest son and I took my "Basic-White" wagon and the NotRod to two local good car-meets, and the wagons were a big hit! Links to those albums below the pics if you care to look. 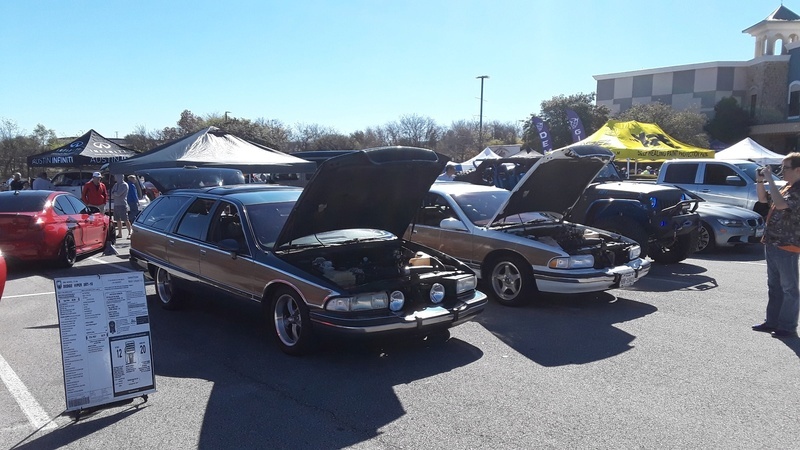 Lastly we too the "long-way-home" from the last car meet and stopped at Lake Pflugerville. 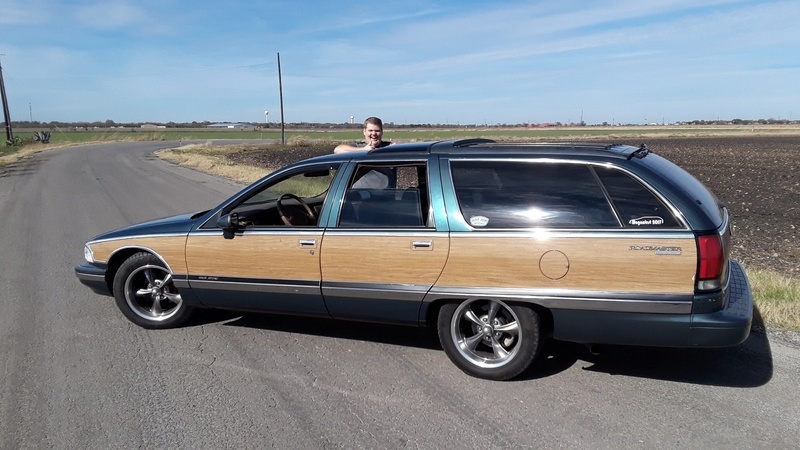 Was a GORGEOUS day and we has such fun running the back roads with the two wagons together. More updates as the come! 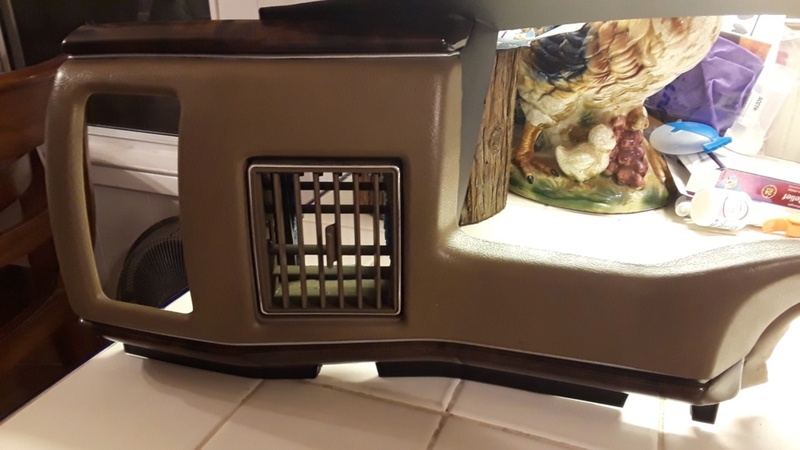 I need to re-dye the steering wheel and repair the door panel on the NotRod, and want to touch up some trim inside as well. 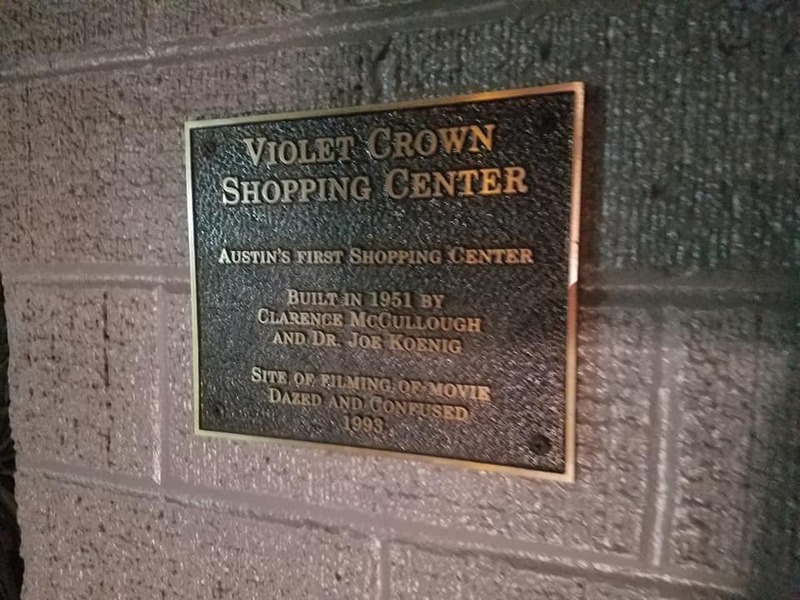 I did a search here on the page, but an not seeing the exact color. 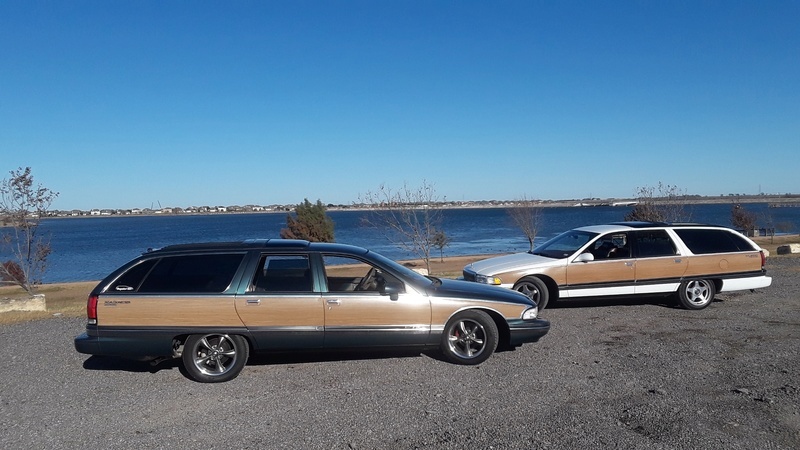 Anyone know the "for sure" tan SEM color for a 1994 Roady wagon? Would like to get this ordered so I can work on it over the Christmas holiday. Well nobody replied but Tim got back to me on Facebook. 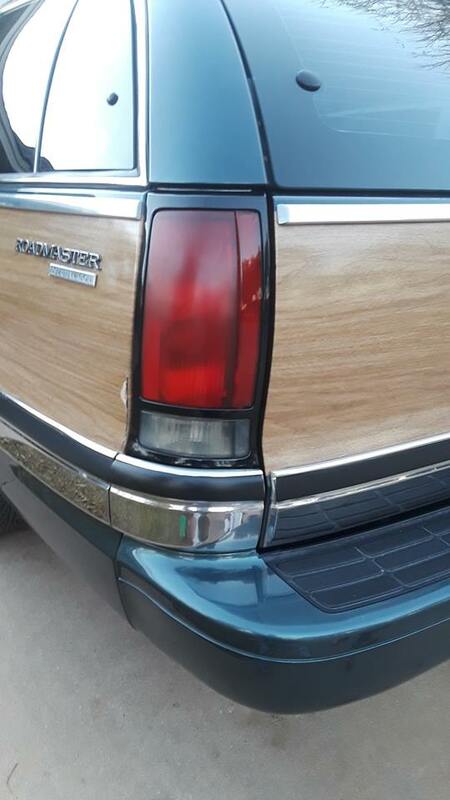 I'm told he's 95% sure the SEM color for the 1994 Roadmaster interior is SEM Saddle Tan, # 15033. Ordered two cans at just under $16 each from Amazon. 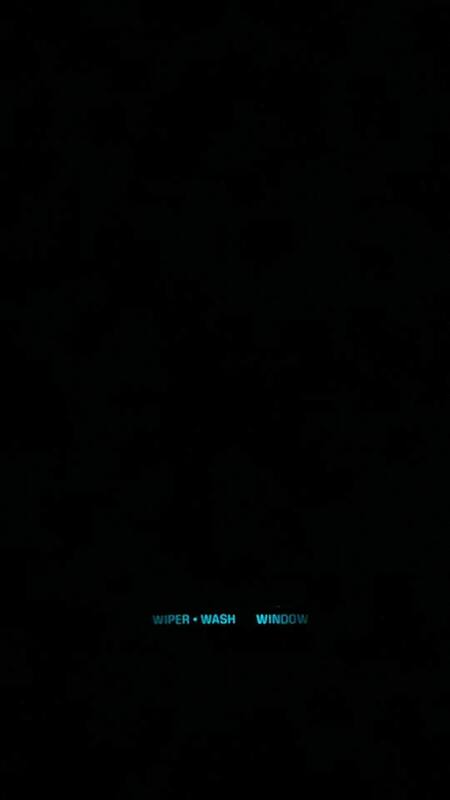 Hope it IS the right color and if so that this helps others on here in the future. Painting plan is the Thursday after Christmas. Fingers crossed! 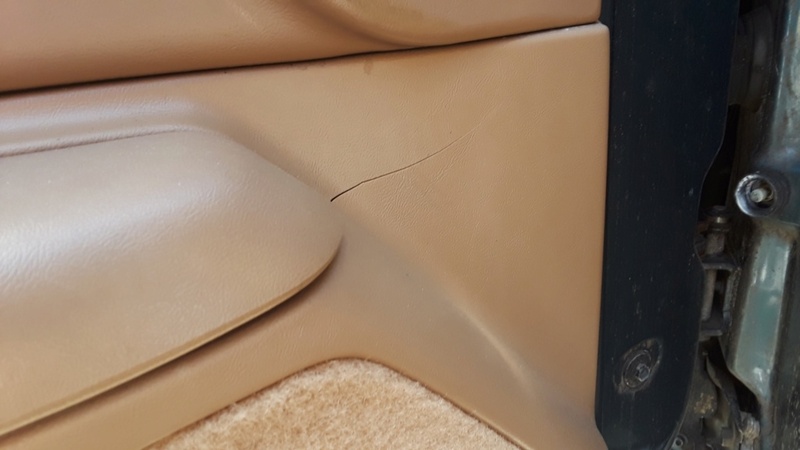 You can use MEK to repair the crack in the door panel. 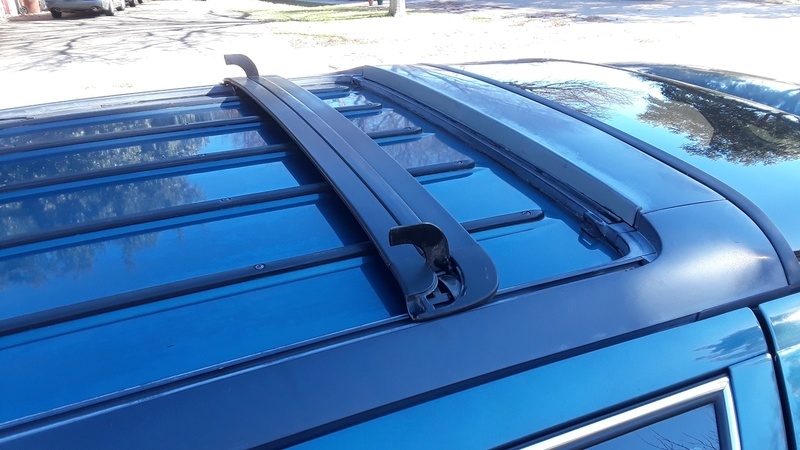 Take the panel off, position it so that the sides of the crack are aligned. Apply MEK to the backside. Once it dries, put a piece of window screen over the repair, and melt some scrap plastic in MEK to use as a "resin". Put a little MEK on the surface and screen, then paint it with the paste. The screen will act like glass in a fiberglass panel. I bought the same one you did. 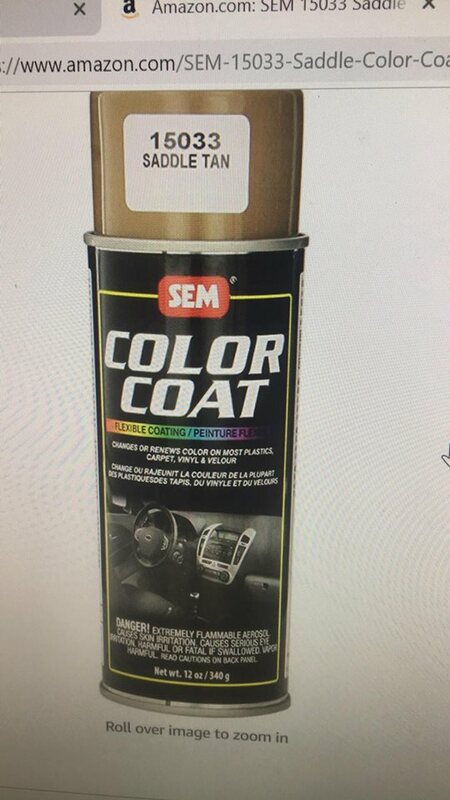 Carquest keeps SEM products on the shelf around here. 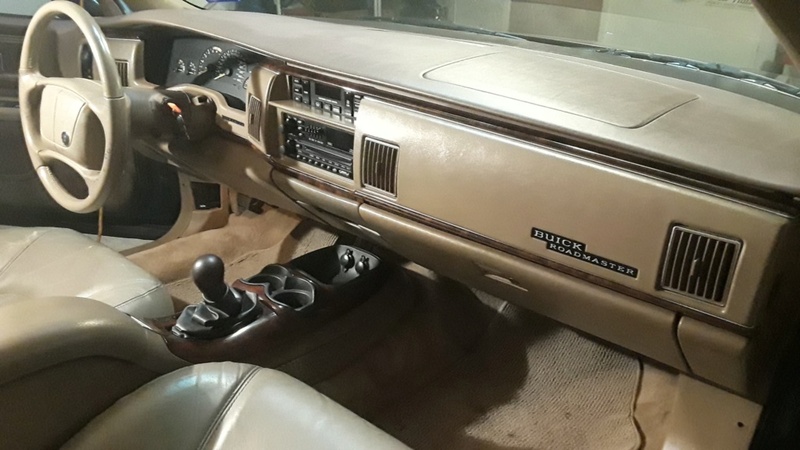 I will be painting the entire dash so an actual match is not a concern. 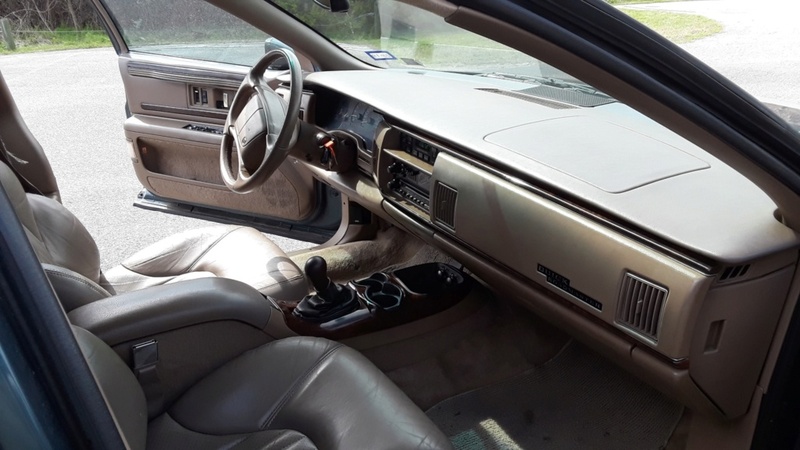 Not sure if the Buick is the same but the Chevy interior is about 5 different shades throughout the car and not much really matches perfectly. Ordered three vans and will be painting as soon as I have some free time on a nice weekend! 1/10/19, so a little update...I hate rust. This is a neat car but you can sure tell where it lived. 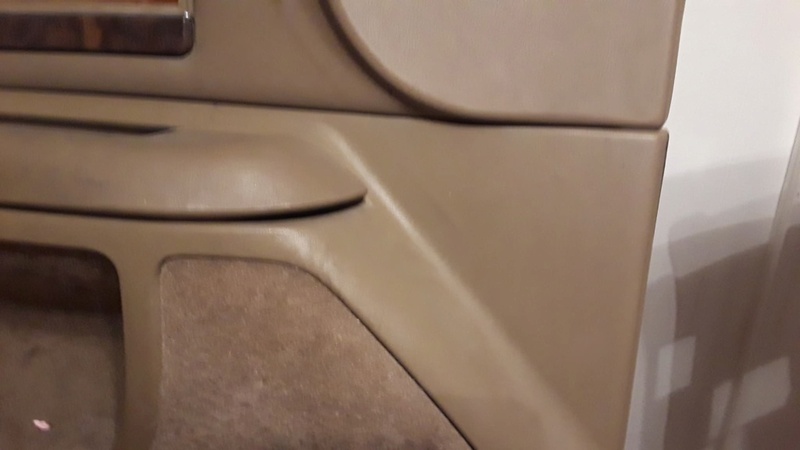 On going through the car, I've decided I want to replace the inner-fender on the driver's-side front...has a rust-hole under the computer. Getting one off a salvage-yard car here is no issue, but all the bolts on the car look crusty. Be more concerned with the speed nuts. They break at the bend, and you can turn the bolt forever, and not get it out. 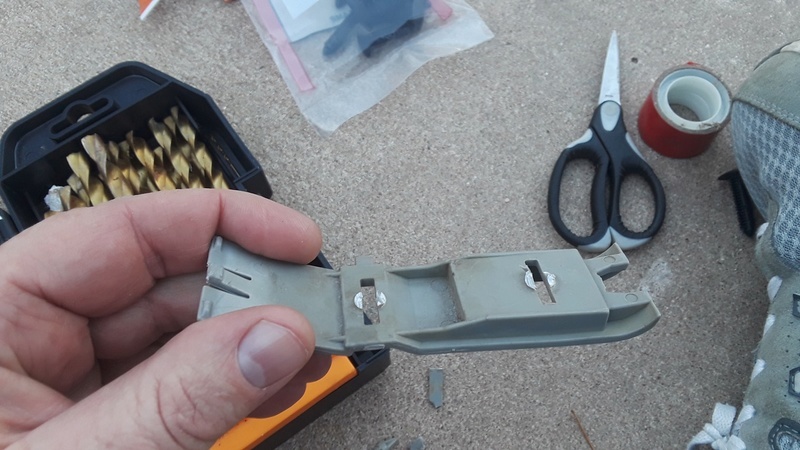 I used a hacksaw blade in one of the holders (not a hack saw frame) and slipped it between the parts, sawing the bolt in two. The cutting stroke must be toward you so you do not fold the blade. Oh joy... Thanks for the heads-up Fred! SO it's been a long time since I've updated this, and figured I better follow-up. 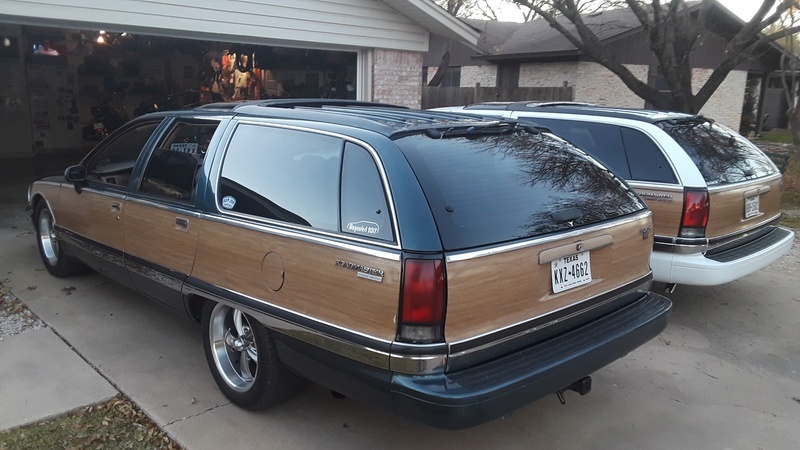 Frankly between the Holidays, family obligations, and really POOR weather here in Texas much of this winter, the 6spd wagon had been just sitting under my carport. I had a car-friend come down from Minnesota over the week between Christmas and New Years, and my son and I met him down in Austin in both the green and white wagons and did a tour of Austin, hit the Top Notch, and had a good time, but on the way back to the suburbs the 6spd wagon developed a loud rattle under it that I thought was a blown muffler, and I'd parked it since. 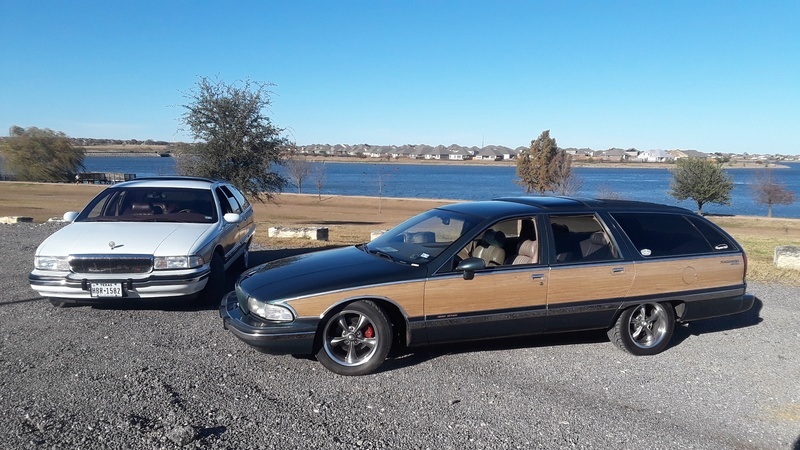 So yesterday, Sunday 2/17/19, it was TIME for me to give the 6spd wagon some love. Thought it had a blown muffler, but turned out to be a bad heat shield. Good deal. 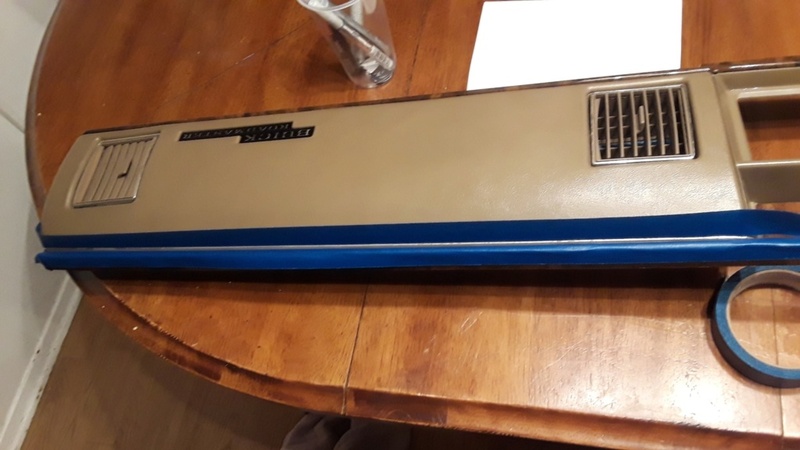 SO opened the hood and decided it was time to clean the Pennsylvania off of it, and to swap the hush-pad. Here are the BEFORE pics. 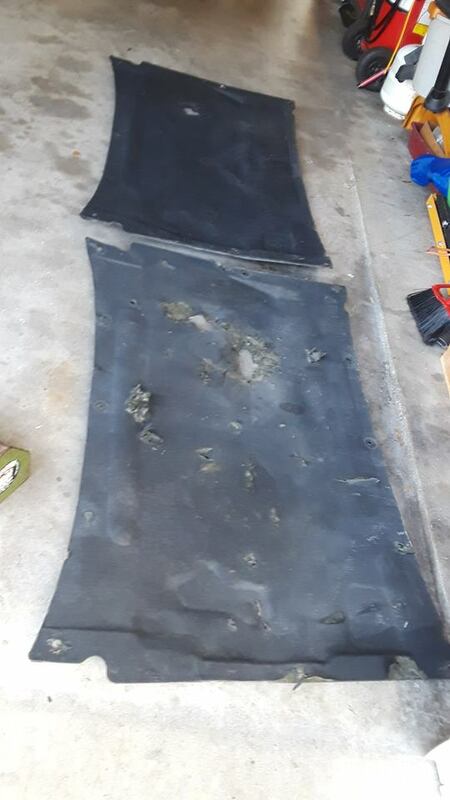 Rotten hood hush-pad removed. Cleaning up under here...everywhere. Was a productive afternoon. 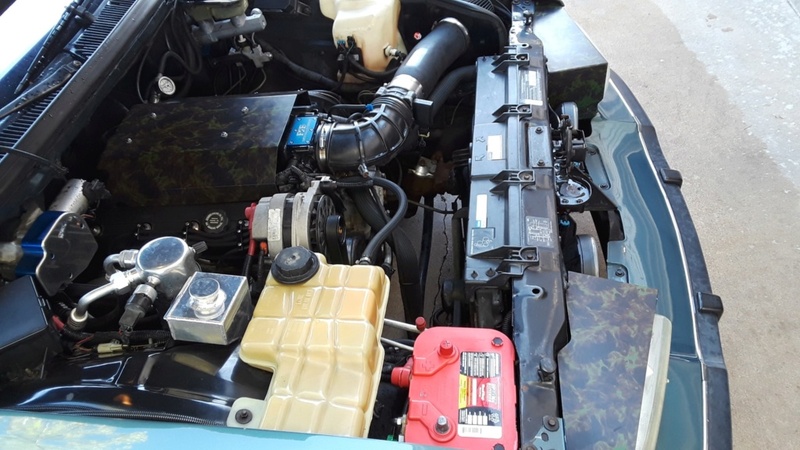 New hood hush-pad installed, engine compartment cleaned and de-greased, then washed the entire car and took a short drive to make sure the underhood was totally dry. 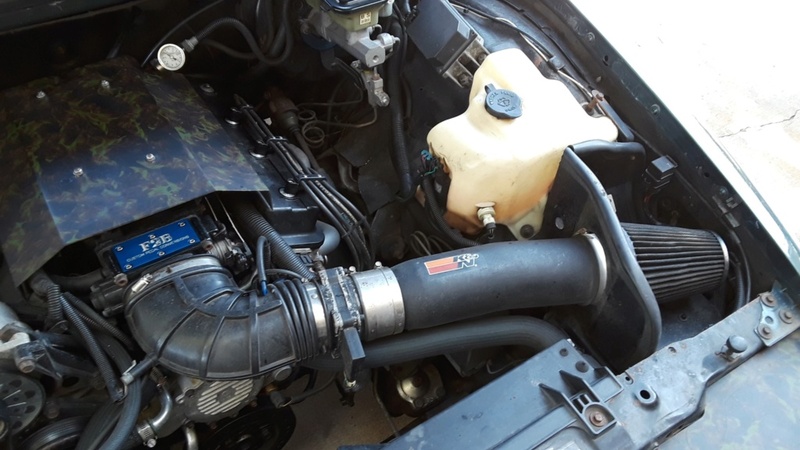 Exhaust rattle gone, underhood looks a lot better. 2/18/19 - Drove this green hotrod to the office today. Getting some estimates for paintwork this week. Ordered three cans and will be painting as soon as I have some free time on a nice weekend! Still have not tried that SEM out I bought, but it's on the list! 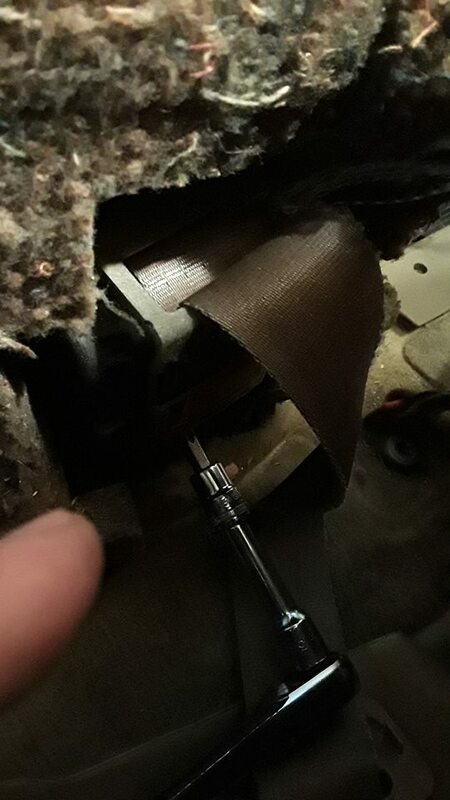 2/18/19 - Small victory, got the Blazer shifter boot to stop popping out of the console in 5th and Reverse. Hint...involved a drill and a screw. Not fancy, but hidden and it works!! Redneck Engineering Expert Level! 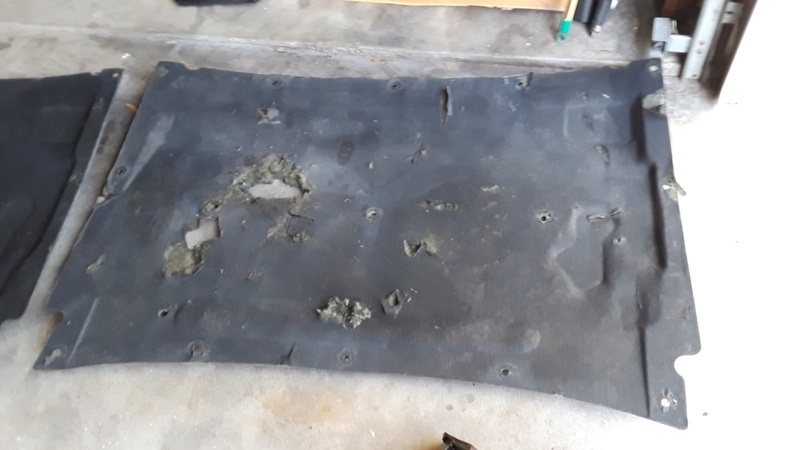 Did you find the hoodpad from a junk yard? Or did you buy it new somewhere? If new, where? You can buy new ones. 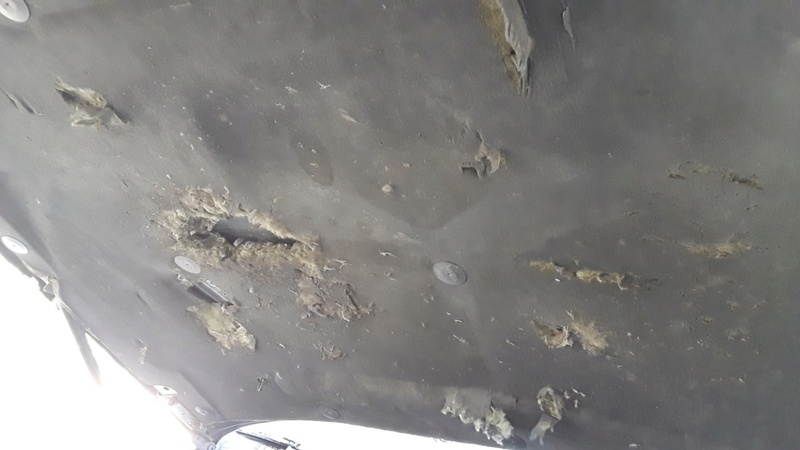 And the hood pad was a salvage-yard fined. 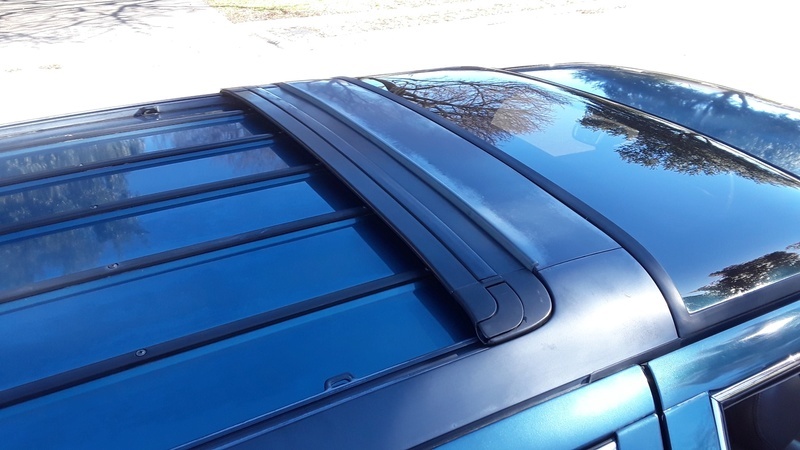 I painted it Semi-Flat Black, which looks about perfect on these when done. Paint the light covers DGGM/clear. 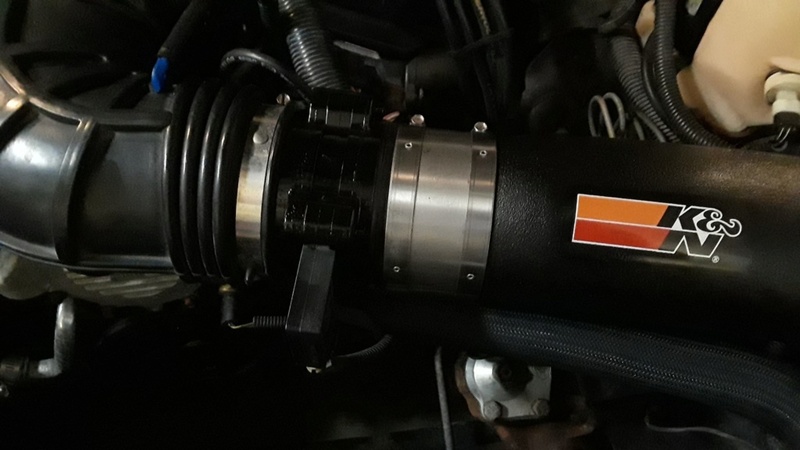 Intake cover... I'd ditch it. 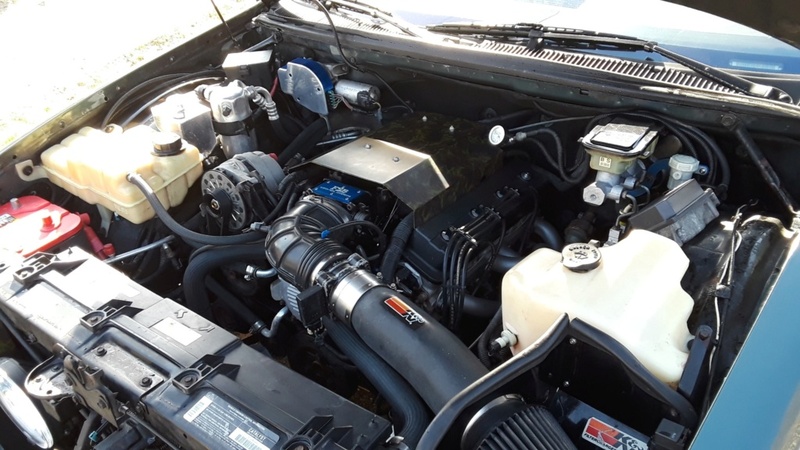 The LT1 intake looks pretty unique. 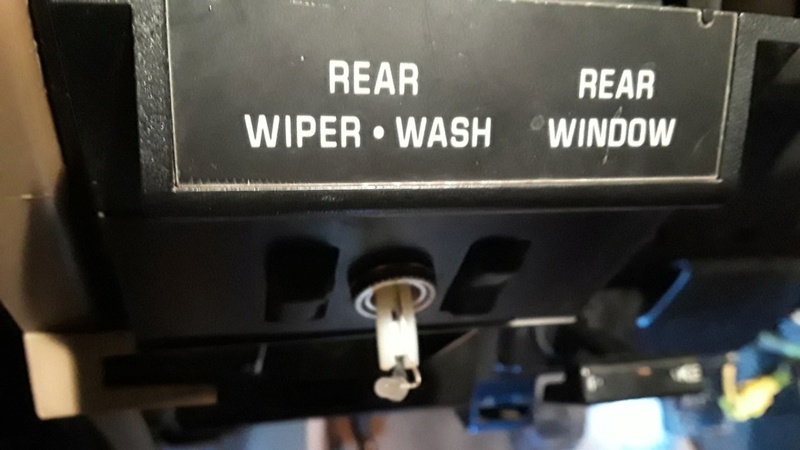 Maybe get a new throttle plate that isn't F2B blue. 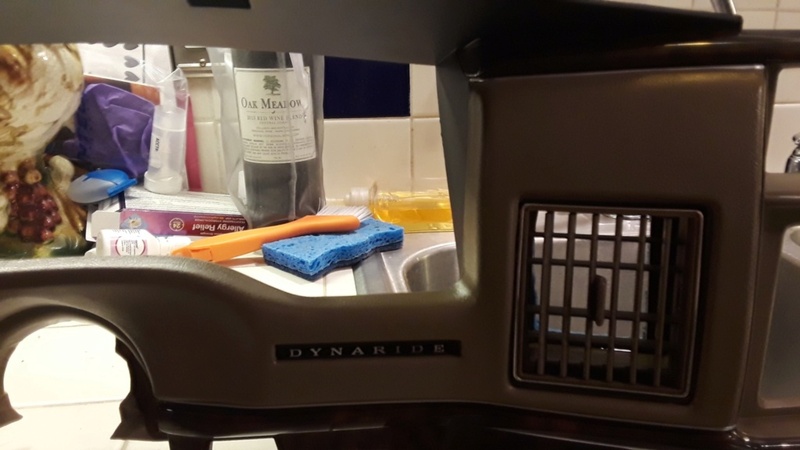 2/19/19 - Planning repairs and mods on the 6spd wagon refurbishment. 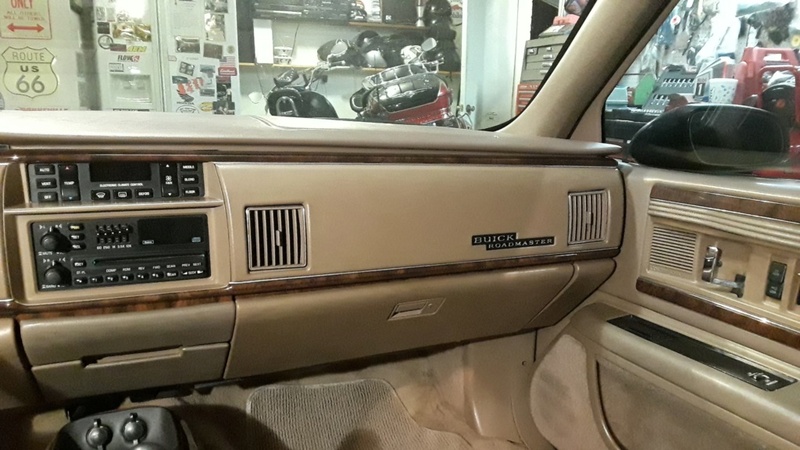 Going to replace the scratched gauge cluster lense and install the Buick tri-shield decal on the cluster face. 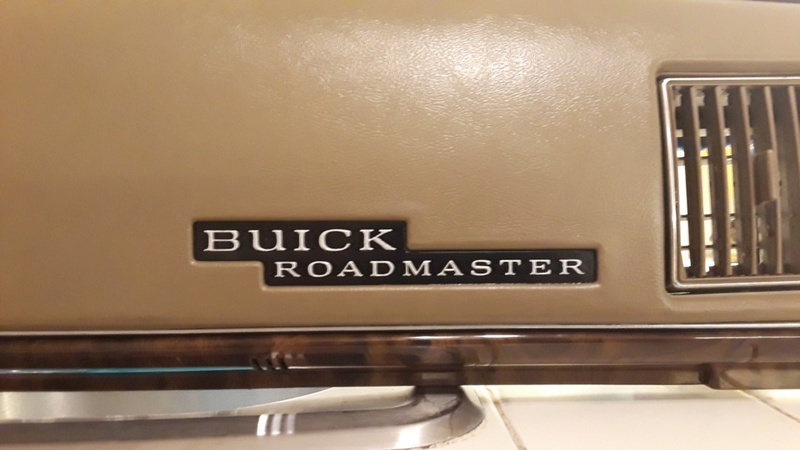 Also have the actual round Buick emblem for the steering wheel, along with SEM paint for the wheel. 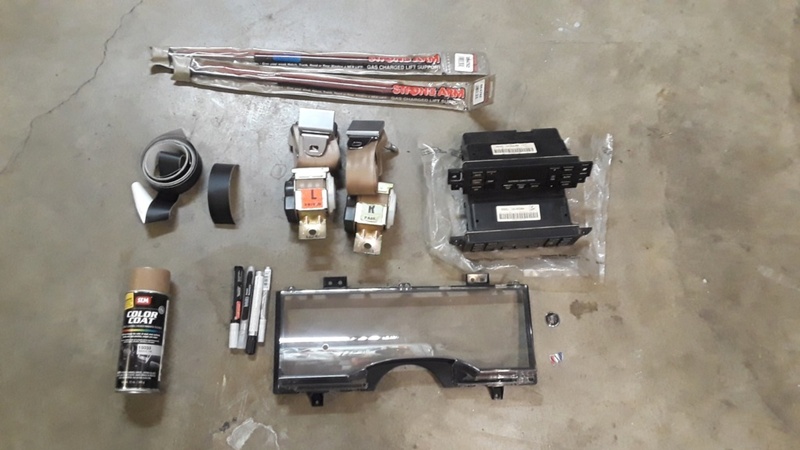 Have non-worn front seatbelts, two climate control heads, hopefully one with working button backlights, new black decals for the bodyside moldings, and new hatch glass struts. Also dug out the silver paint-pens to re-do the dash trim. 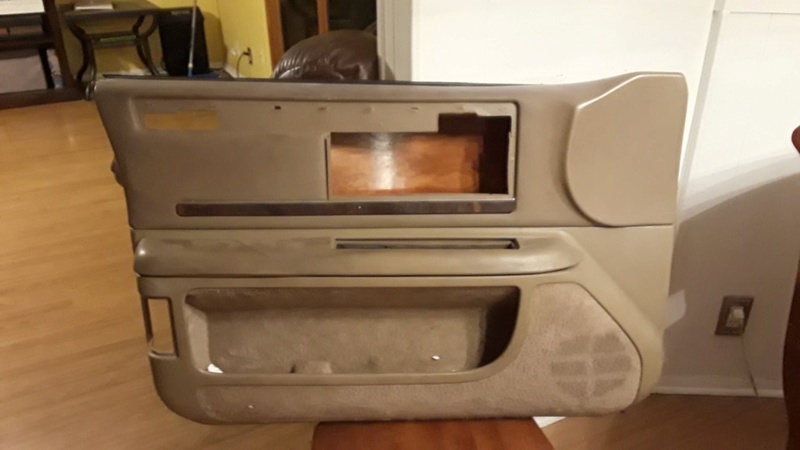 I've also got a good lower plastic driver's side door panel to replace the cracked one. Will try to use the better UPPER door trim from the car now with the non-cracked lower door panel. 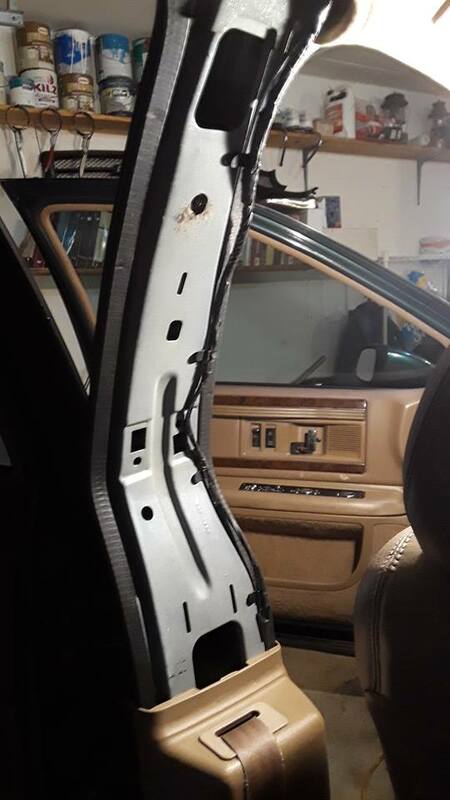 I "built" the same door panel in red on my '96 wagon. Lots to do! 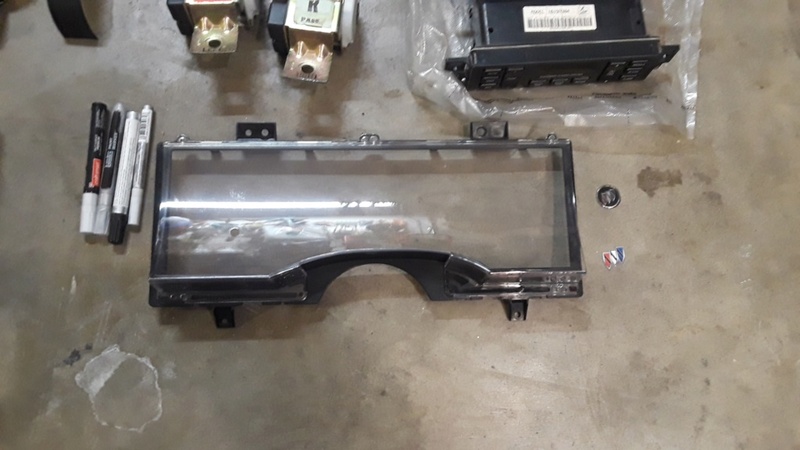 The gauge cluster lens has a deep scratch above the steering column, so will be installing this decent replacement. 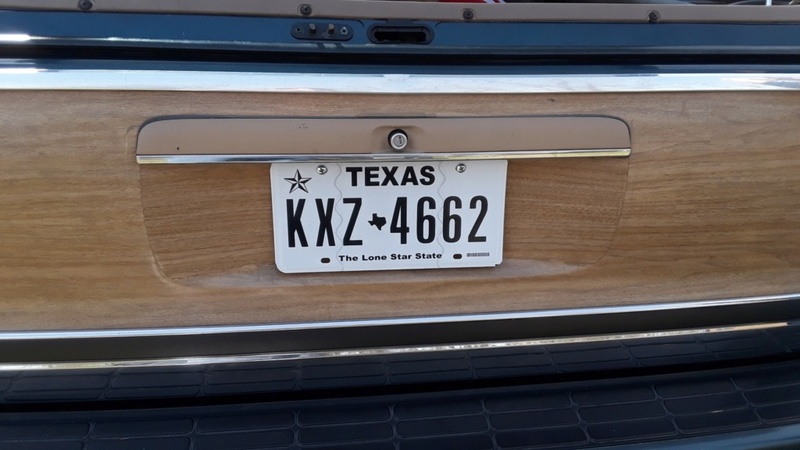 Just polished it. 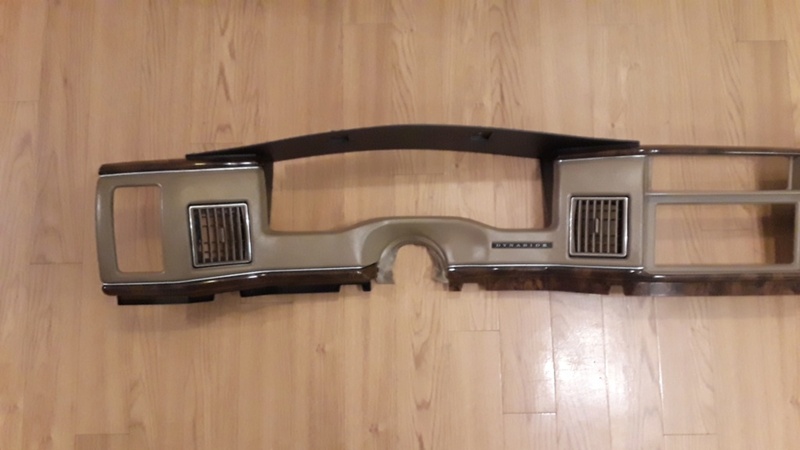 Also will be adding the Buick tri-shield decal the the Camaro cluster face, which is a great little detail that I did on my white wagon. Round emblem on the top is for the steering wheel. 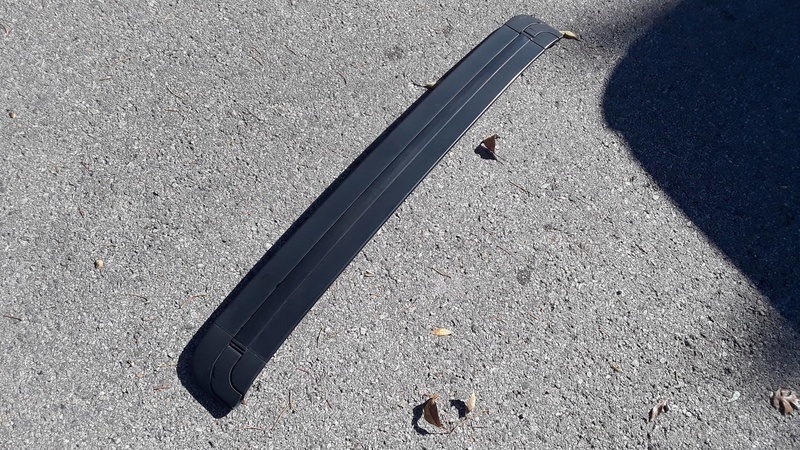 It's metal, and came off the pre-94 Buick wheels. 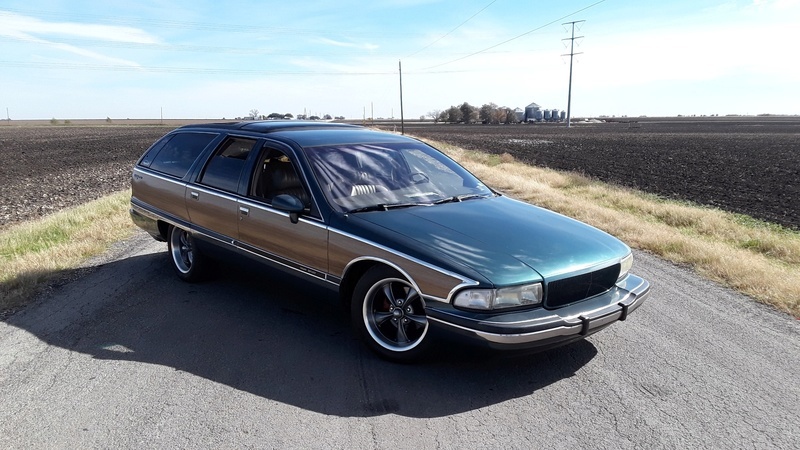 Looks a LOT nicer than the interior-color emblem the 94+ wagons have. 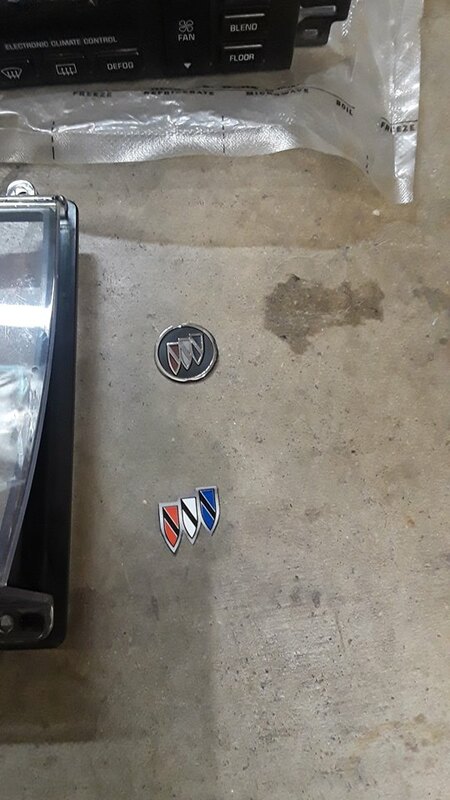 The lower tri-shield decal will be added to the Camaro gauge cluster face. Checking out dash lights on the 6spd wagon. The Camaro cluster lights work perfectly. These came from a '93 Camaro, so have the yellow backlight colors and orange needles. 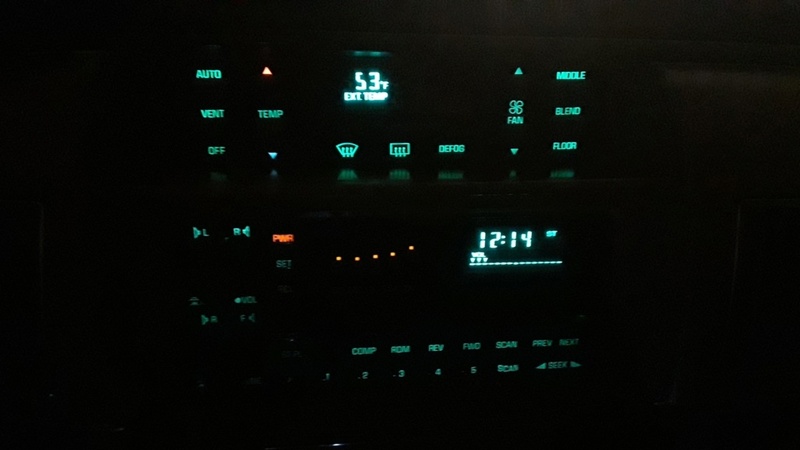 The cluster in my '96 wagon had the white backlights, and I added white needles on my '96. Fun to compare them. 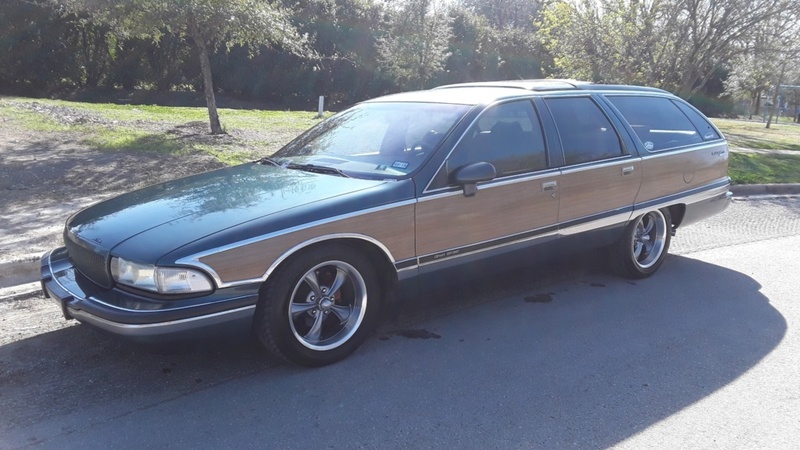 My only mod here will be adding that tri-shield Buick decal above, under the fuel and temp gauges. 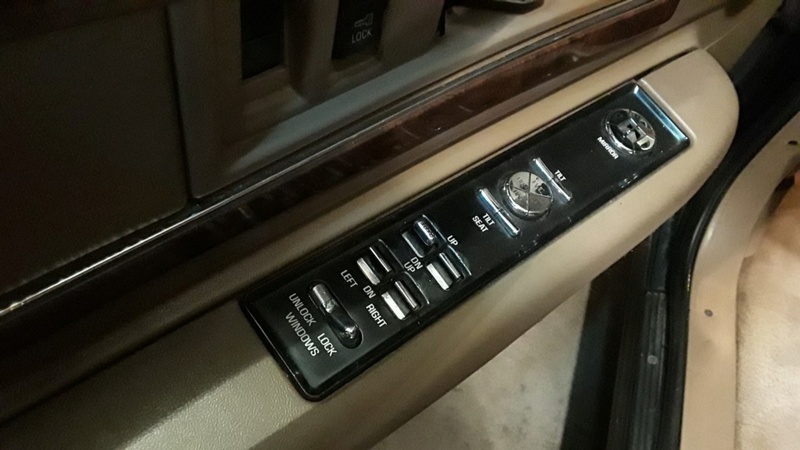 The backlights for the buttons on the original climate control head are out, so hoping one of these spare heads will have good lights. 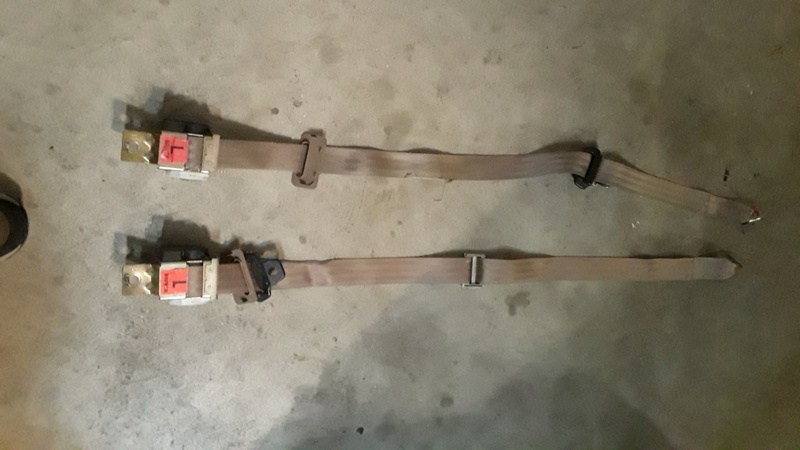 The seatbelts in the car are both frayed, and these are good used replacements. 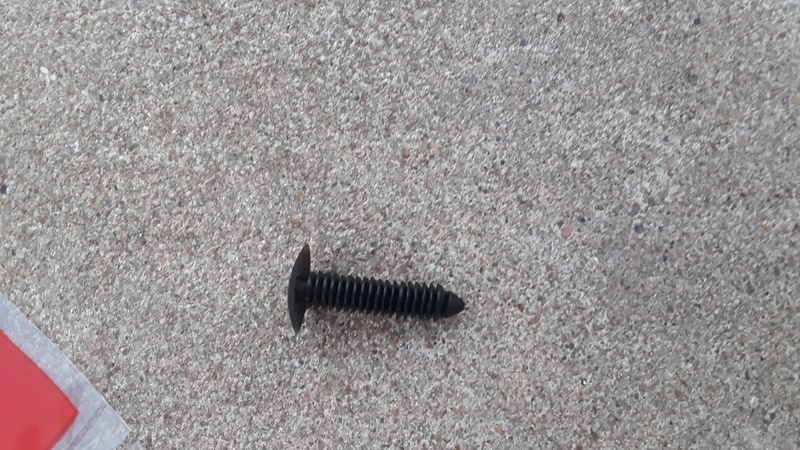 I replaced these on my white '96 wagon already, and other than breaking the mounting bolts loose, it's not a hard job. The hatch glass stays up, but barely. These will fix that! 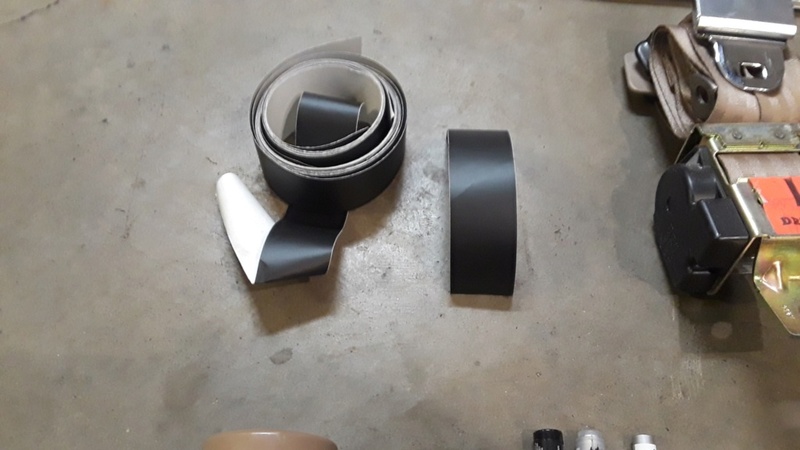 This is the black tape for the chrome bodyside molding. 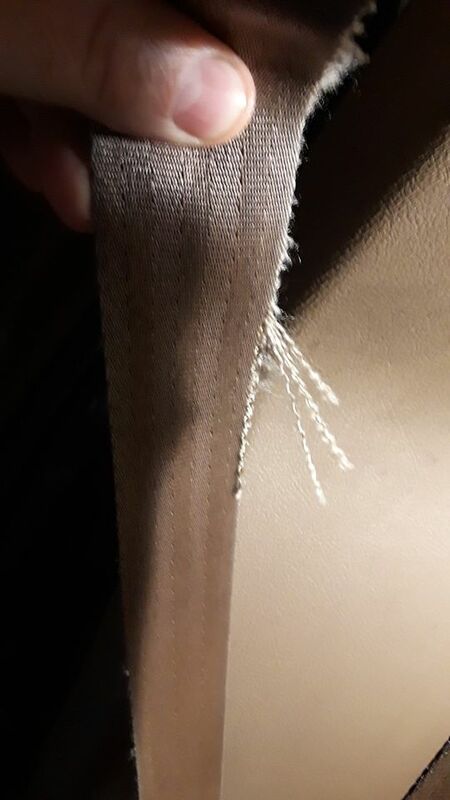 This was used in place of the trim that always falls off. Just need to re-do a few areas. 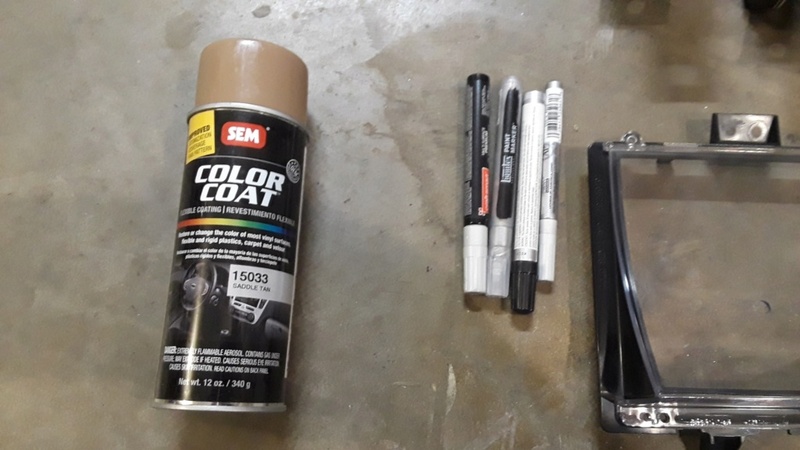 I bought this SEM paint to re-do the worn steering wheel, and the silver paint markers are for the dash outline trim. It's all in the details! 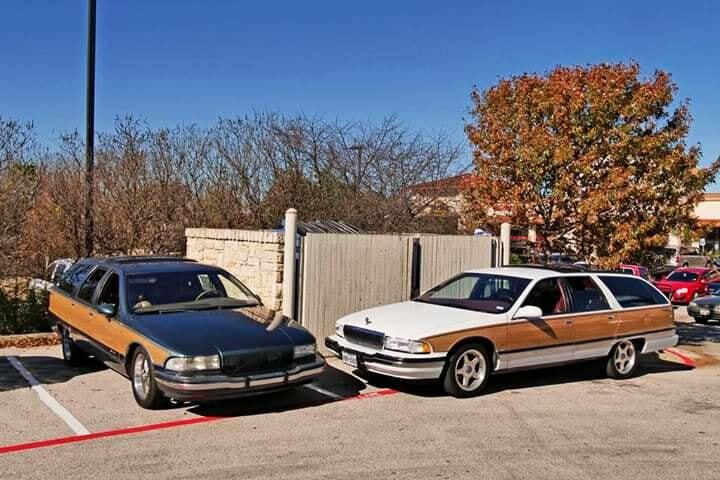 The first rule of ownership of a 94-96 Roadmaster is you NEVER slam the door on these cars. 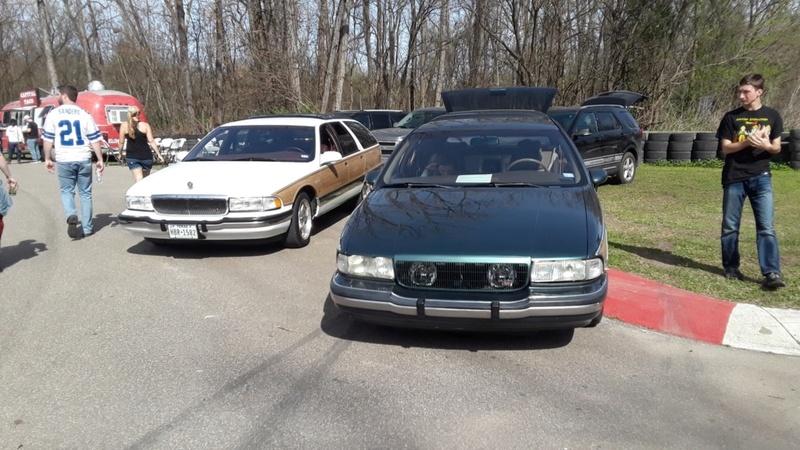 The SECOND rule of ownership of a 94-96 Roadmaster is you NEVER slam the door on these cars!! Typical crack seen here on the 6spd wagon now. HAPPILY I have a perfect replacement. 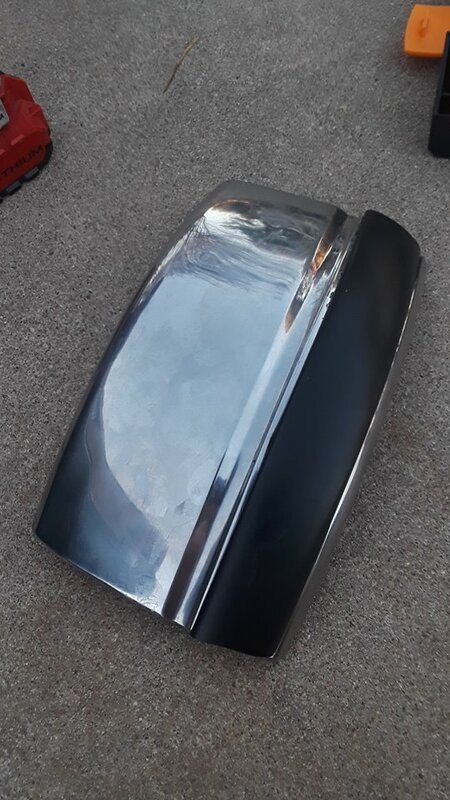 RARE good lower plastic driver's side door panel to replace the cracked one on the car now. Will try to use the better UPPER door trim from the car now with the non-cracked lower door panel. 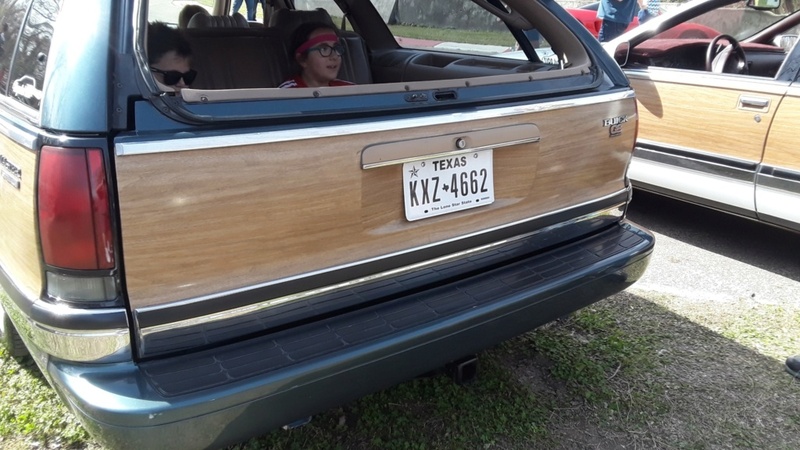 I "built" the same door panel in red on my '96 wagon by taking two and making one. This alone is a good project. Oh the PROJECTS we have on this car! 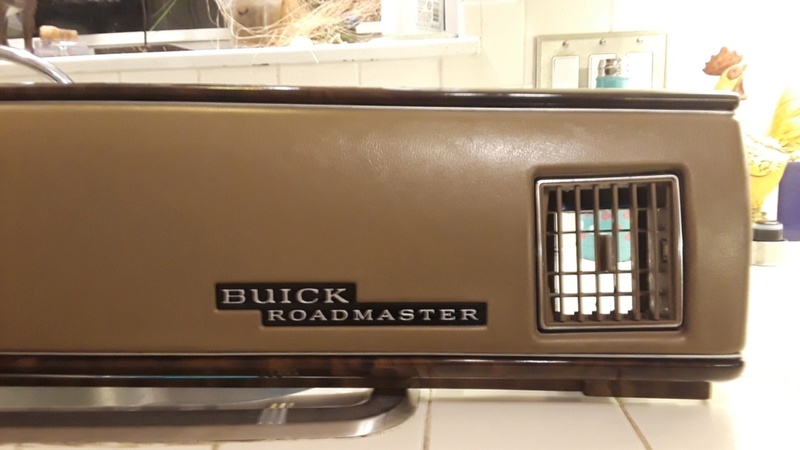 2/20/19 - wanted to replace lens on gauge cluster and add tri-shield Buick decal to cluster face, but lense was GLUED ON, so had to settle with polishing the existing lense. I got a good bit of the scratch out. Looks much better! 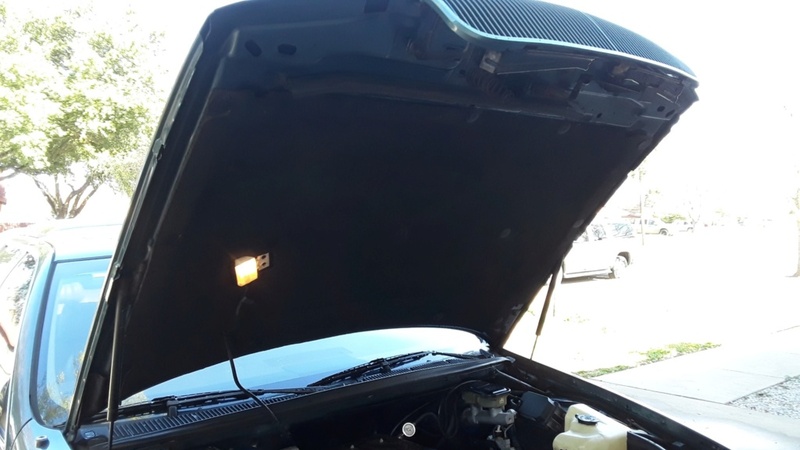 This tiny bulb is the backlight for the foglight switch. Parts store doesn't stock bulbs this tiny. I miss Radio Shack. Will nab these at the salvage yards from now on. 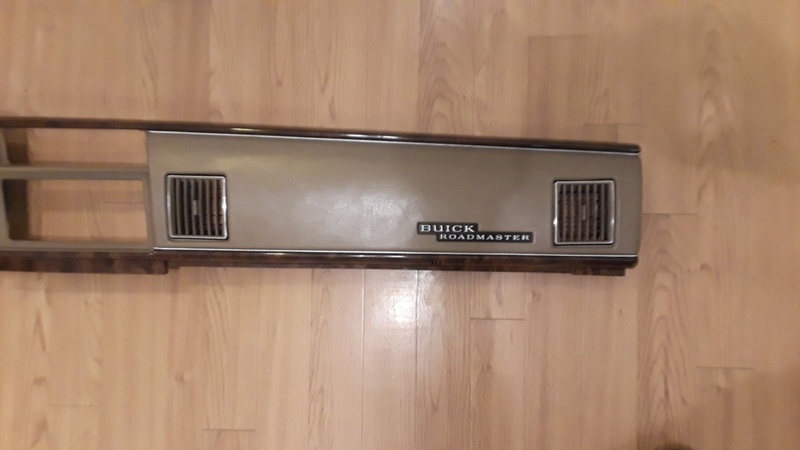 Cleaned the dash bezel and repainted all the chrome trim lines, and the Roadmaster dash emblem. Paint pens and a steady "somewhat" hand! Ha! Installed the new climate control head in the 6spd wagon. Works great and nice to have working backlight buttons again! 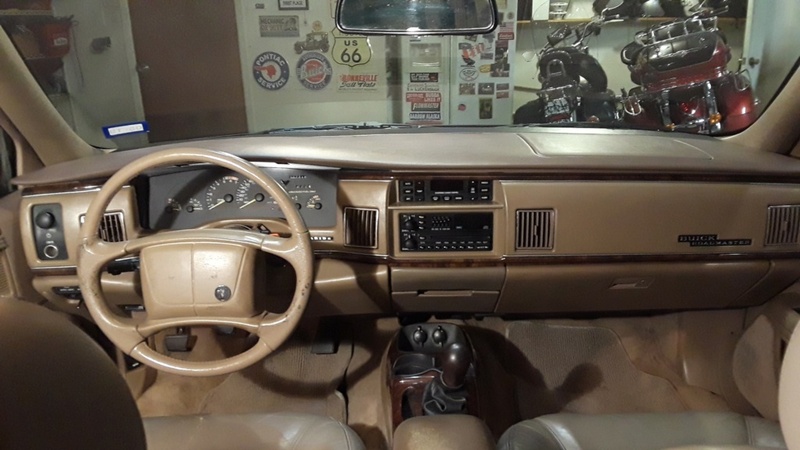 Dash cleaned from top to bottom, new climate control head installed, polished the Camaro gauge cluster lense, installed new fog light switch, installed cleaned dash bezel with chrome trim repainted, and added Buick emblem to steering wheel. Was too cold to paint or steering wheel would have gone re-dyed tonight too. That's next. Having fun polishing the rougher edges on this cool old hotrod....err...NotRod. 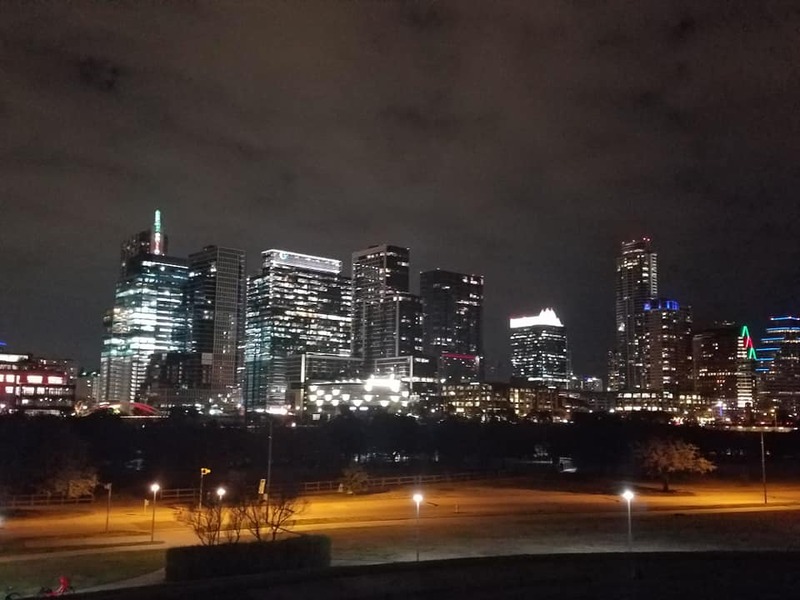 2/22/19 - Had an EVENTFUL night with the NotRod project. 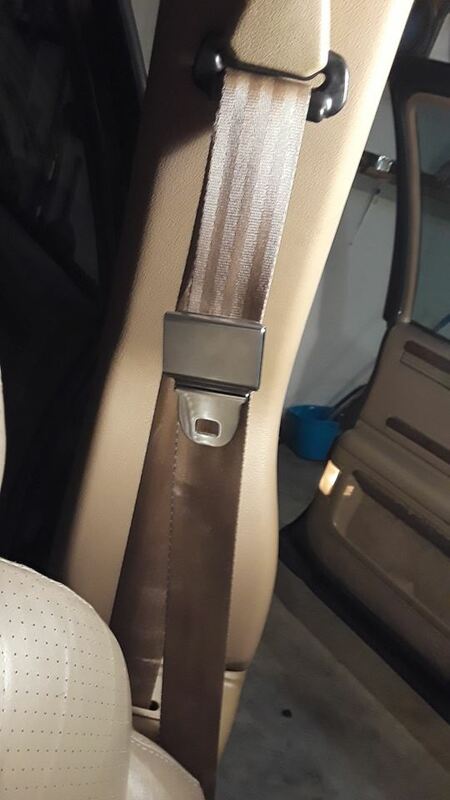 Started by removing and replacing the driver's-side seatbelt, which was worn and frayed. 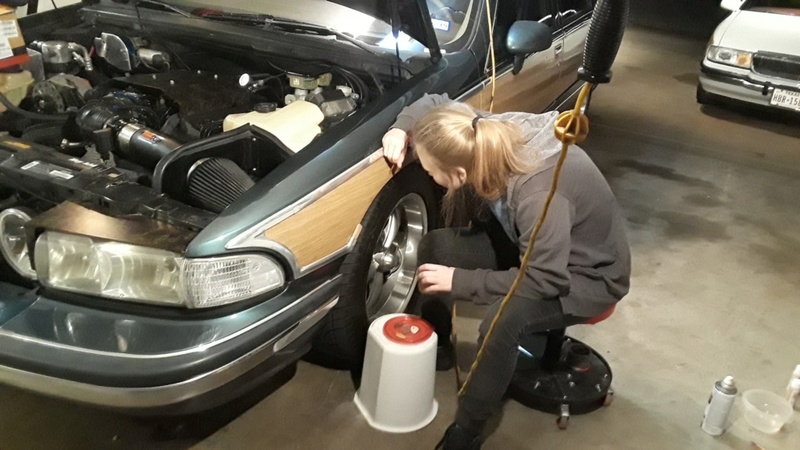 I'd done this project before on my own '96 Roady wagon, so I knew the routine, but forgot to take into account that THIS car came from the land of salt...the lower seatbelt bolt that bolts to the floor beside the driver's seat was frozen, and I mean FROZEN! 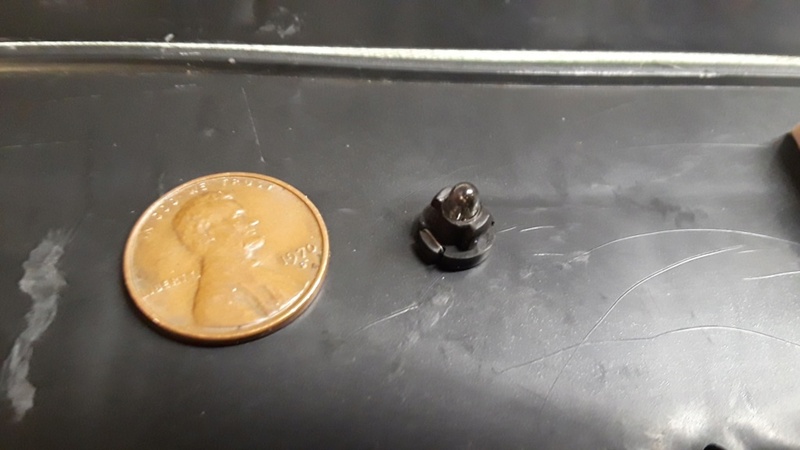 I finally got it out buy putting my torx socket on an adapter so I could use my breaker bar, and I actually managed to TWIST my torx socket slightly before that bolt broke free. CRAZY. 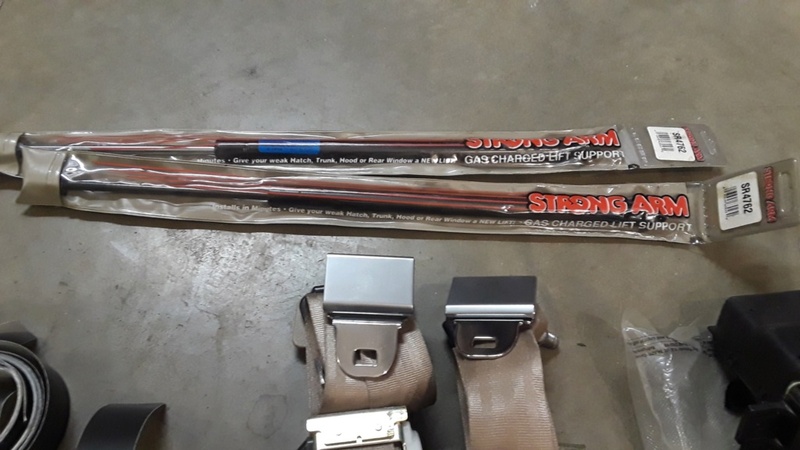 But it came out, and I installed a used but still very nice replacement belt. 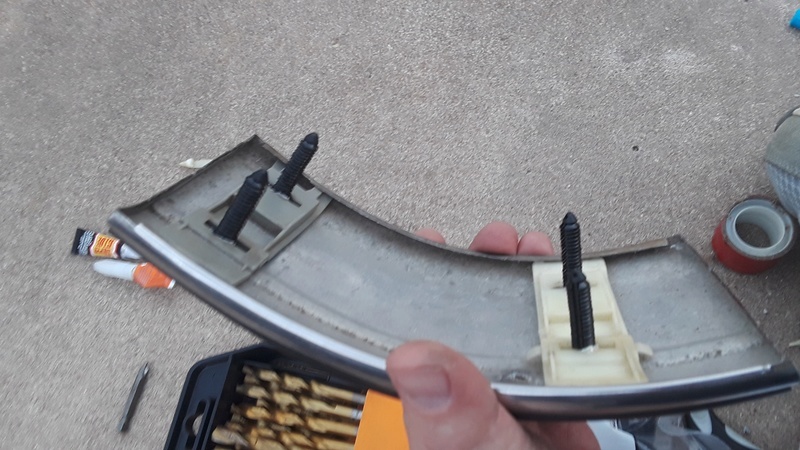 Oh and the other two bolts, on the B-pillar, came right out. Again a pain but really nice replacement. 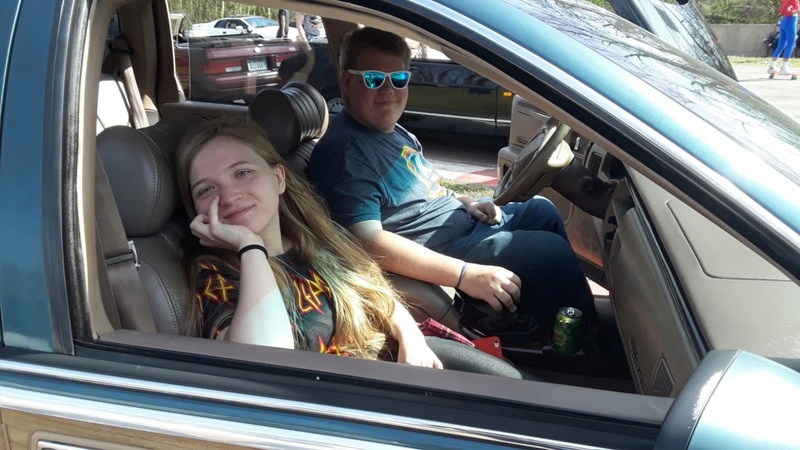 I'd invited my "other kids", Lili and Joseph down from Temple for the weekend for the big Radwood Austin 80s-90s-only car meet. 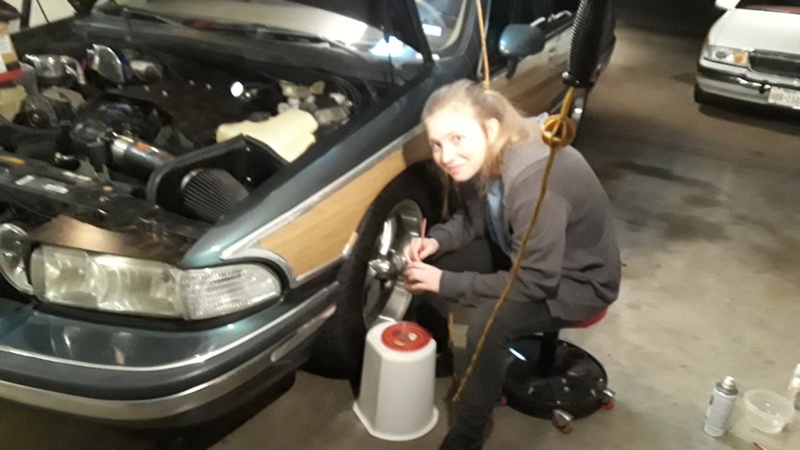 They showed up about 8:30pm, and Lili then spent the next three hours in the garage with me working on the wagon. 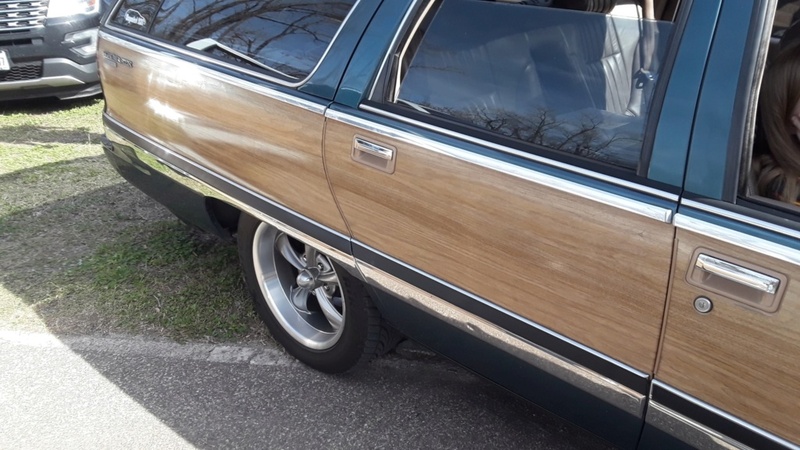 She used three different colors of artist paints, and touched-up the woodgrain all over the car. Really blended will, and while you can see the touch-ups when you look up close, from 2-3 feet back the car looks TONS better. 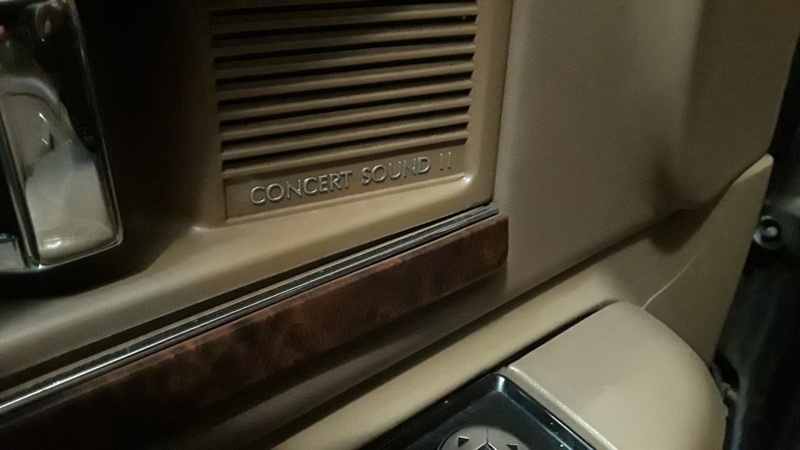 We also touched up all the worn black areas on the door panel switchplates and painted the Concert Sound II lettering under the door speakers. 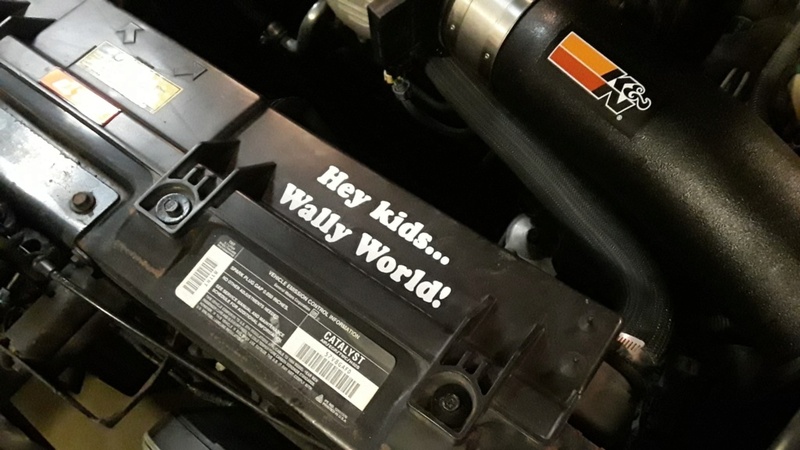 Also repainted the MAF sensor black, replaced the radiator cap and rusty bolts on the fan shroud, and added a much-needed decal to make folks smile! 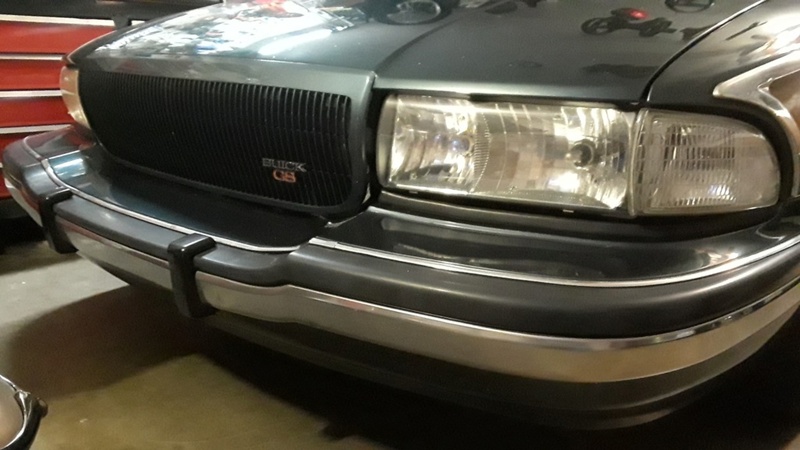 Lastly I added the GS emblem to the grill...looked naked without it, and finally polished the headlights. Car is really looking good! 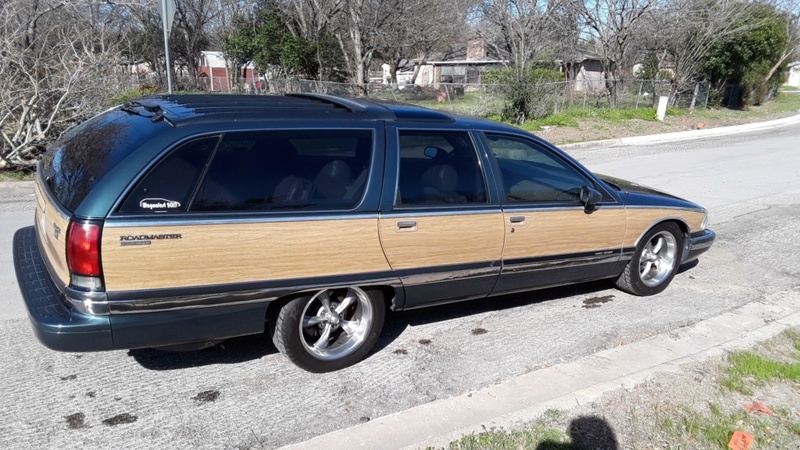 2/23/19 - Daytime pics of the touched-up and detailed wagon from Radwood Austin. The NotRod was a HUGE hit. Everyone did a double-take when they realized it was a stick. I've posted more pics and the Facebook Album link to the 400+ car pics from Radwood here: https://www.facebook.com/media/set/?set=a.10218347249183278&type=3 and in the Car Show section as well. 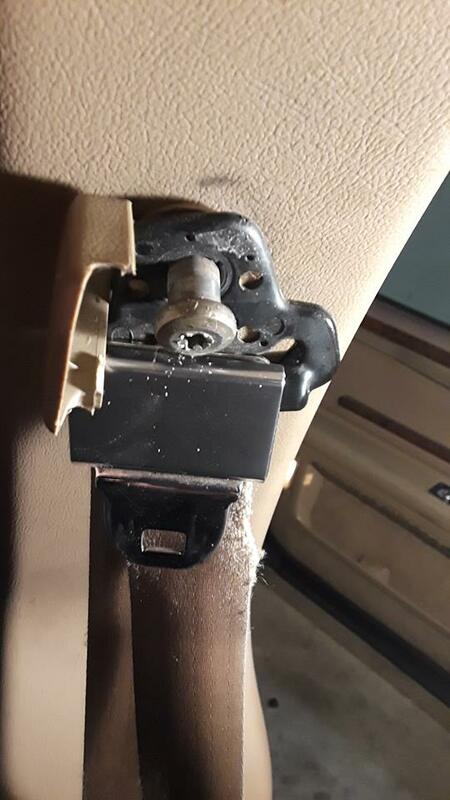 I have twisted a couple of Torx bits in the bottom seatbelt bolts. 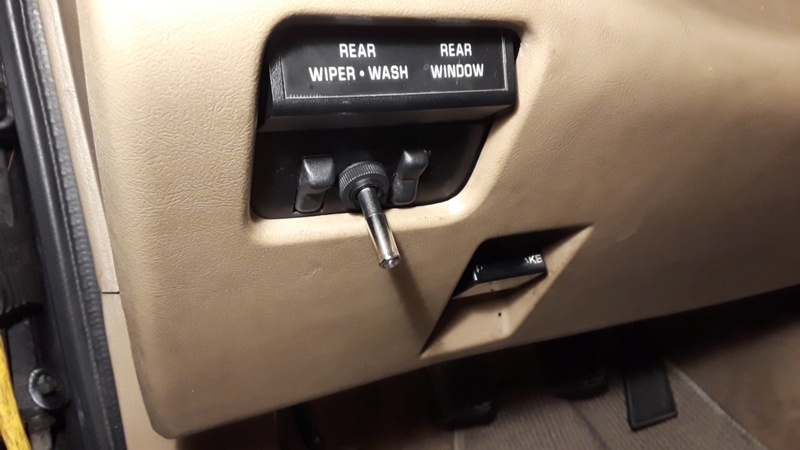 I often use an extension, or breaker bar on my ratchet when removing the seatbelt bolts. 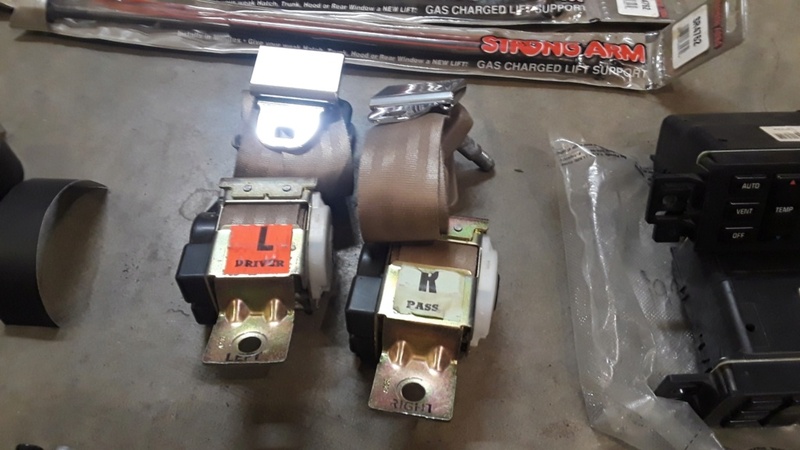 I also have a swivel head breaker bar/ratchet that allows me to put the grip on the same plane as the bolt head, and avoid angular torque on the bit. I also broke a TORX on a C10 trying to remove the belt. Fortunately it was a cheapie, and I got another better one. I'd never seen one twist before. Shocked it didn't strip or break entirely.